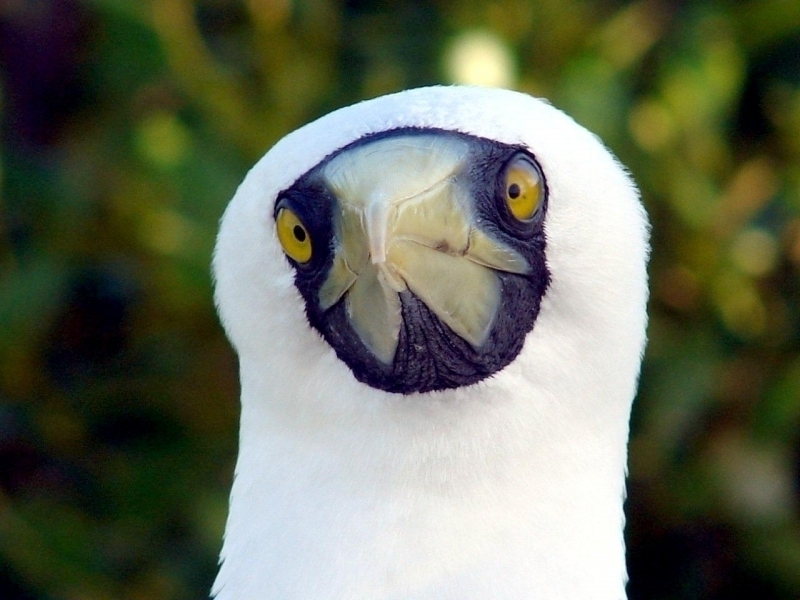 Masked Boobies are found mainly in the tropics in the Atlantic & Pacific oceans. 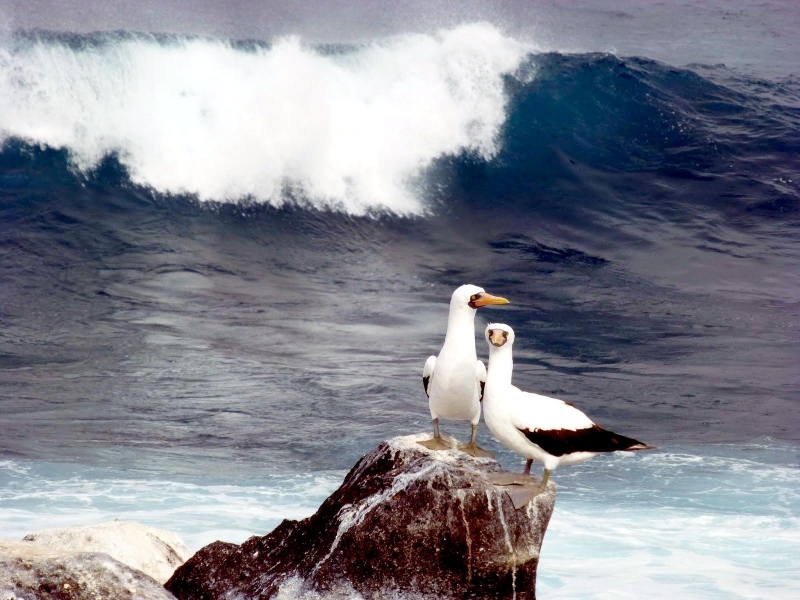 In the United States, they are restricted to the Hawaiian islands of Lehau, Moku Manu and Kaula. 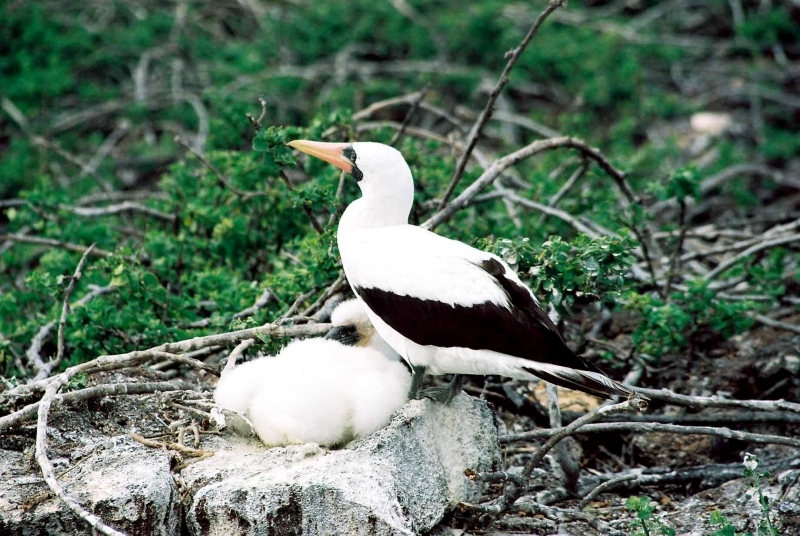 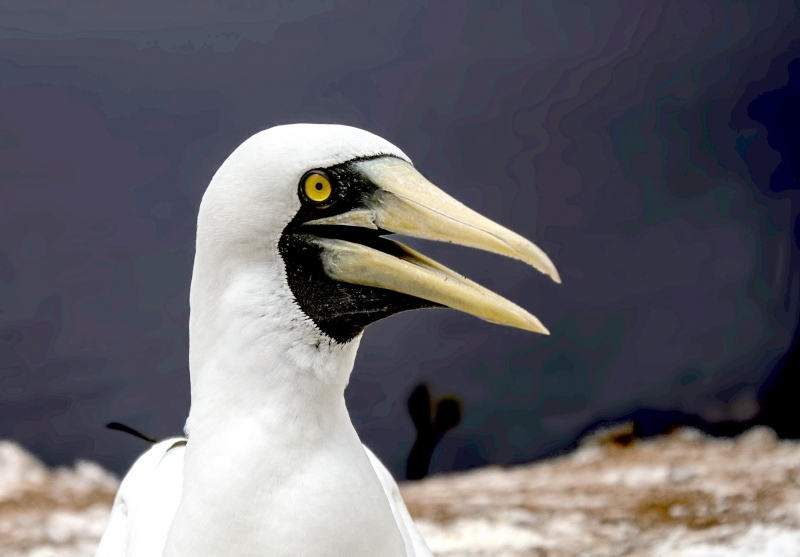 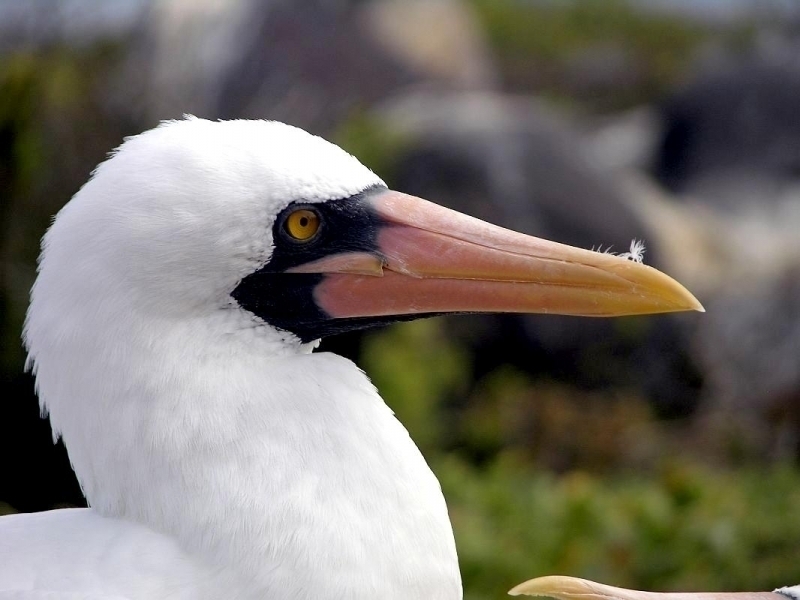 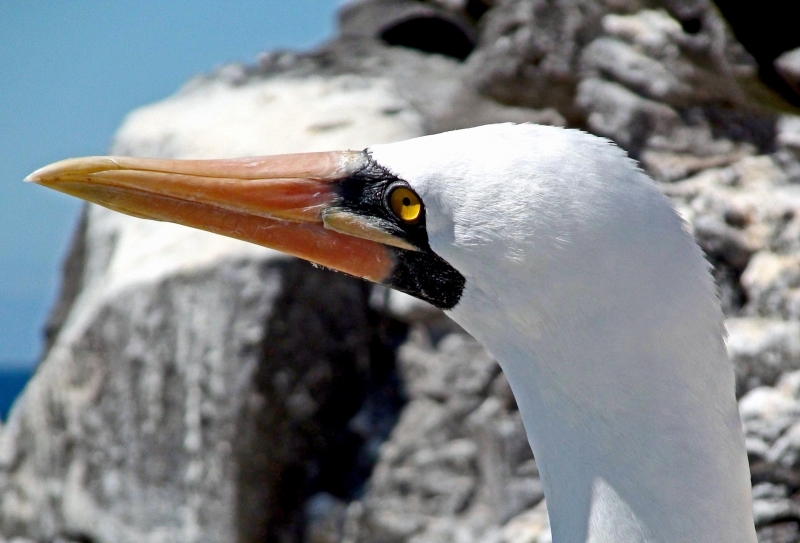 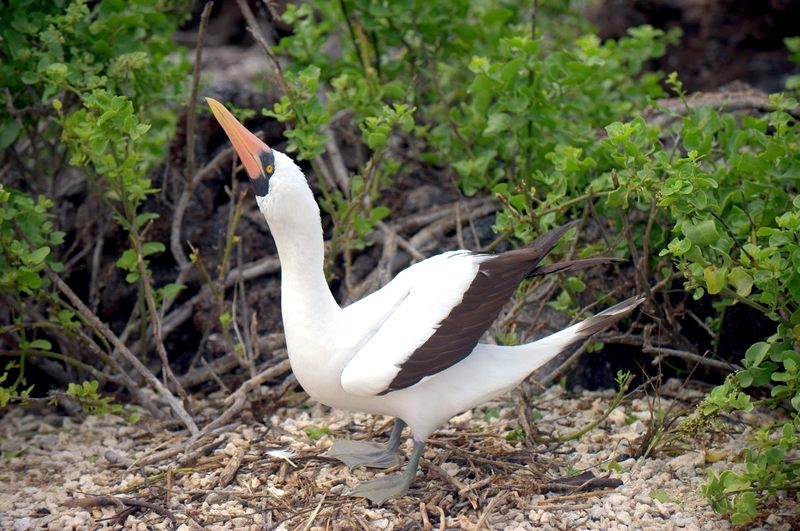 Masked Boobies are found off the Yucatan peninsula and in much of South America. 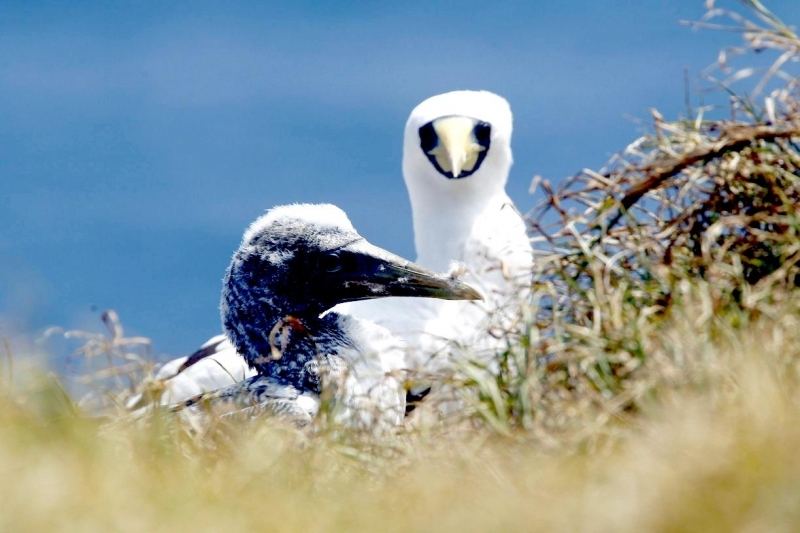 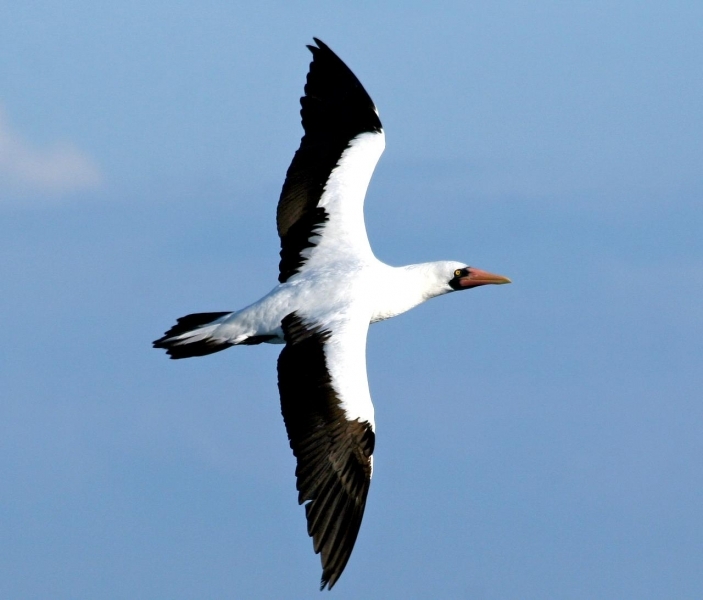 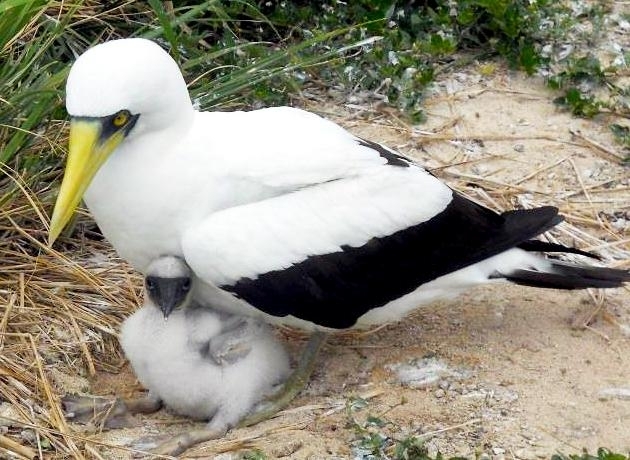 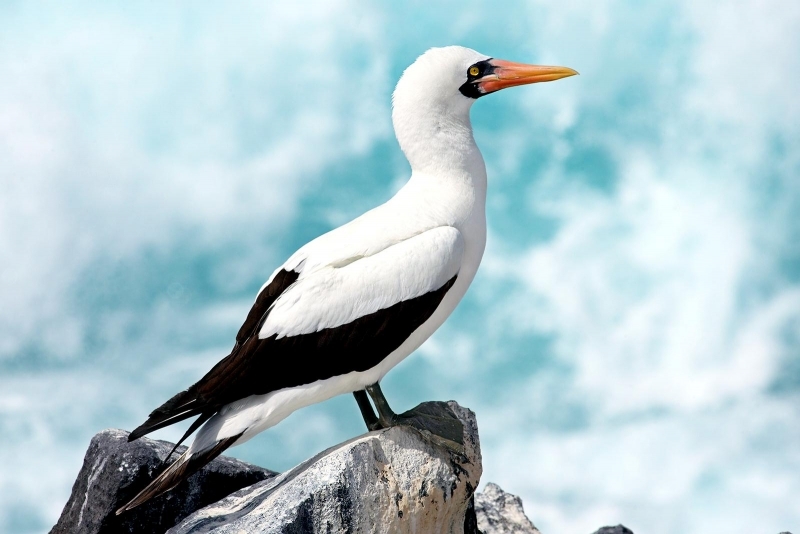 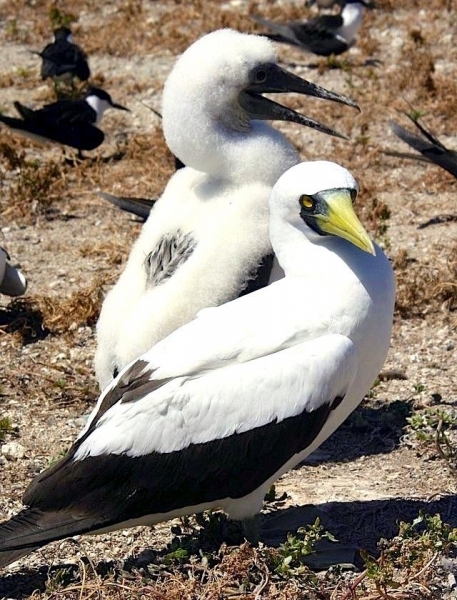 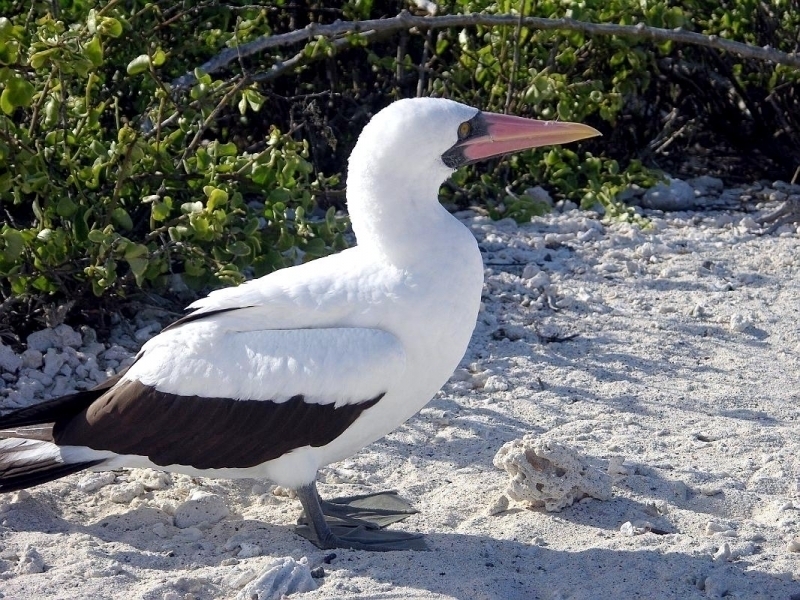 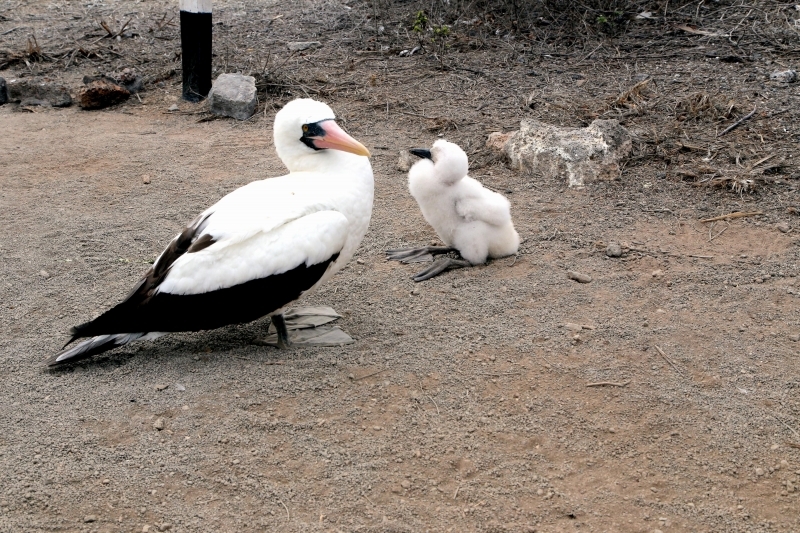 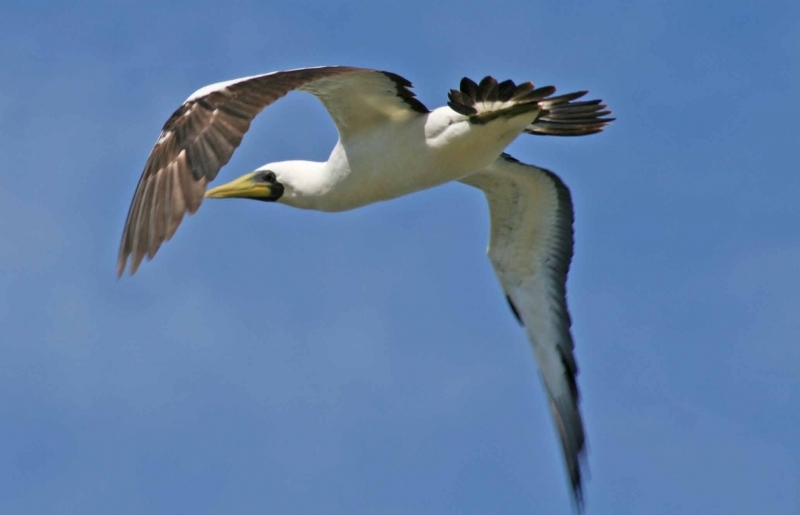 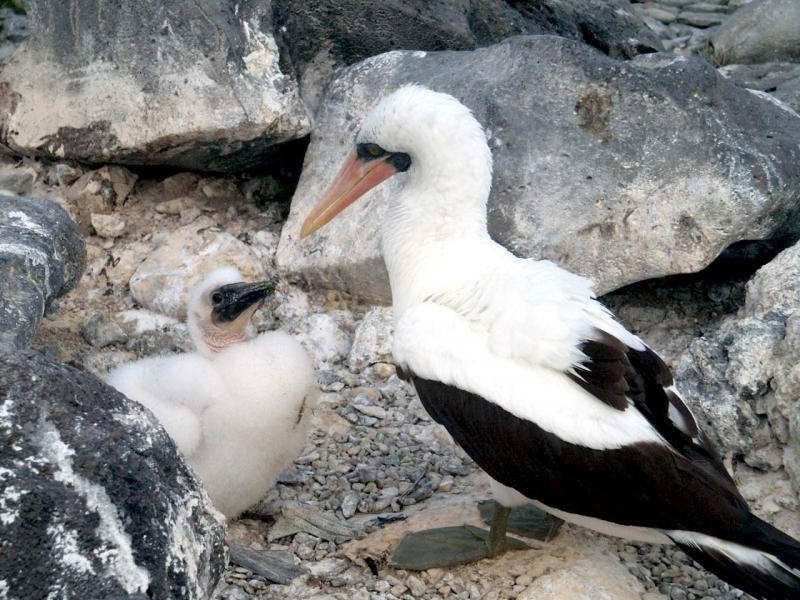 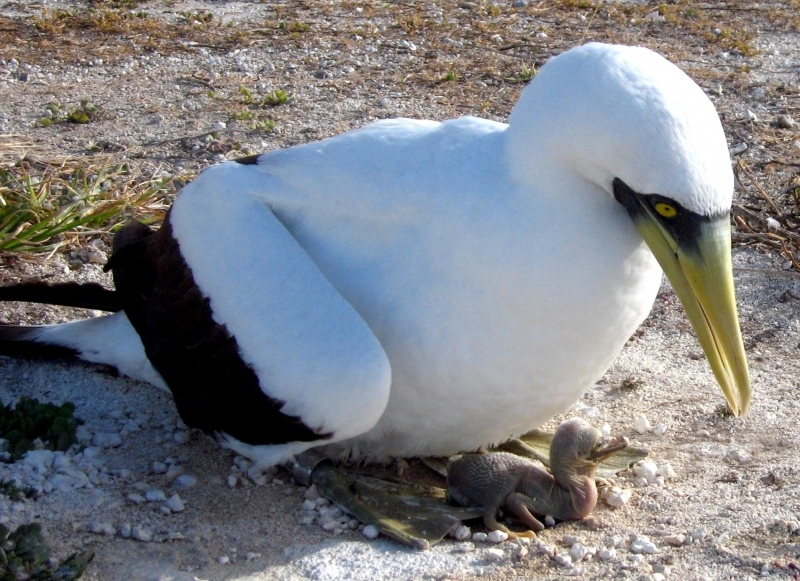 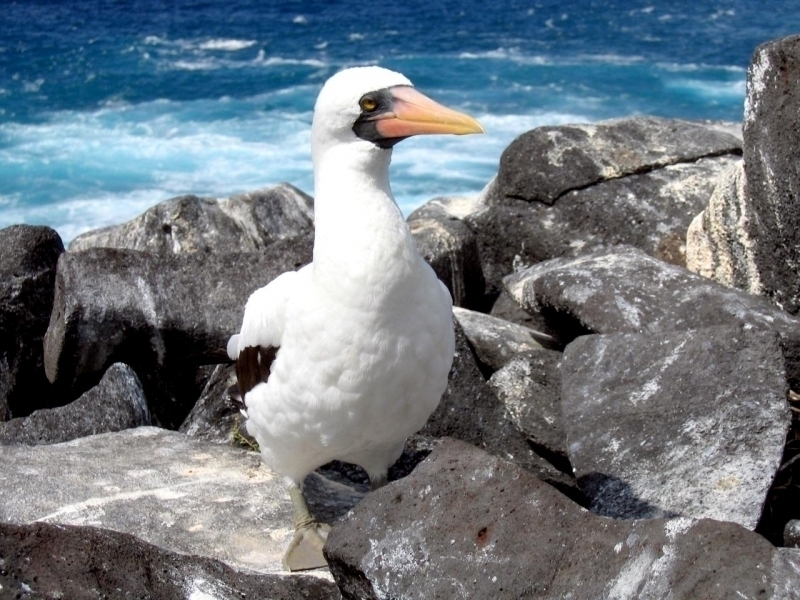 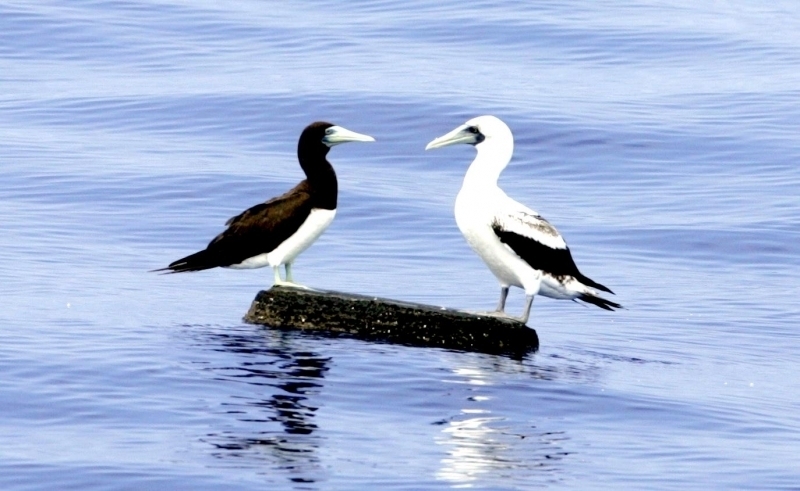 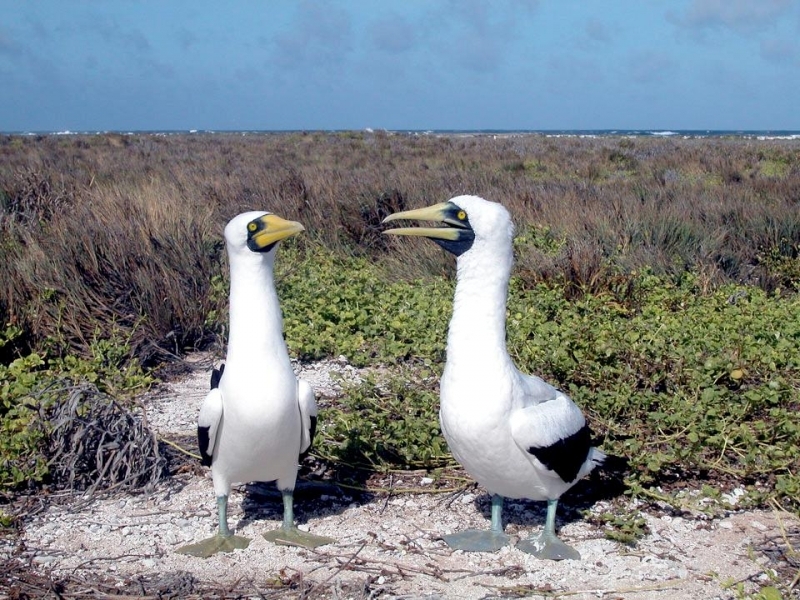 There are a variety of Boobies with different ranges, but Masked Boobies are found on many islands with tiny habitats from the Pacific to the Red Sea and even on islands near Indonesia & Australia. 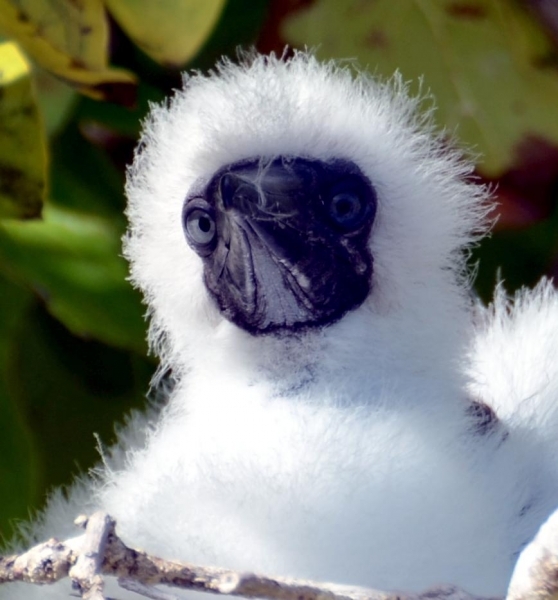 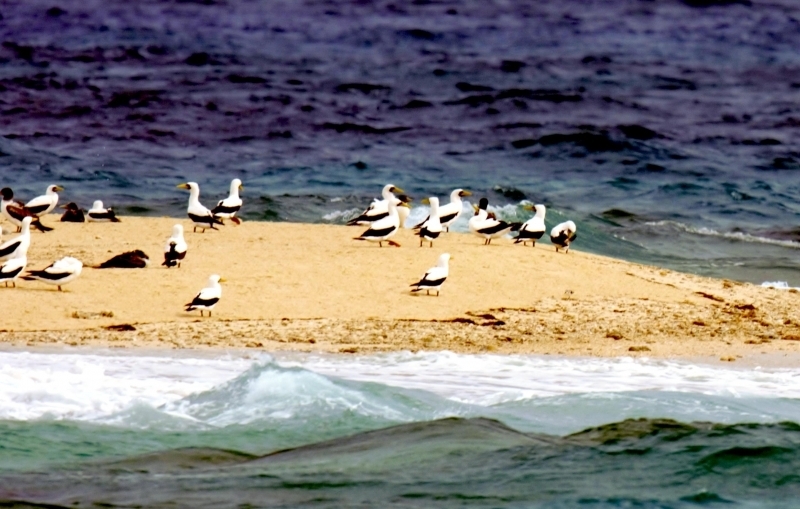 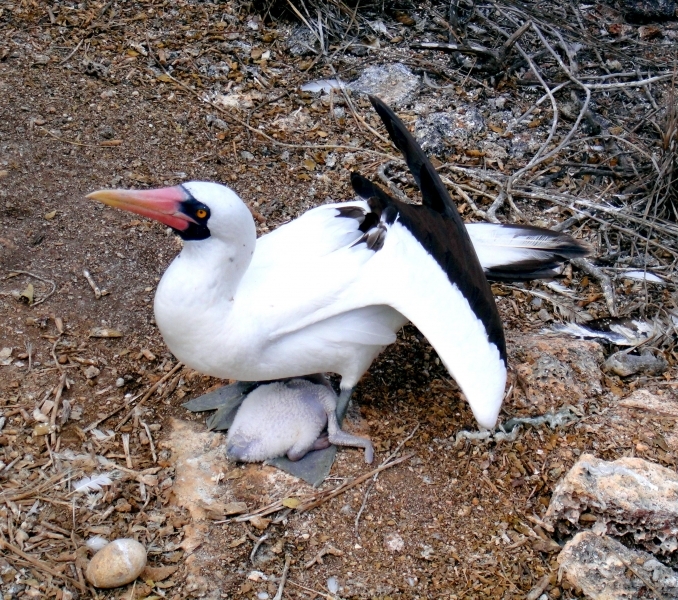 Masked Boobies prefer to live on small, flat islands without trees. 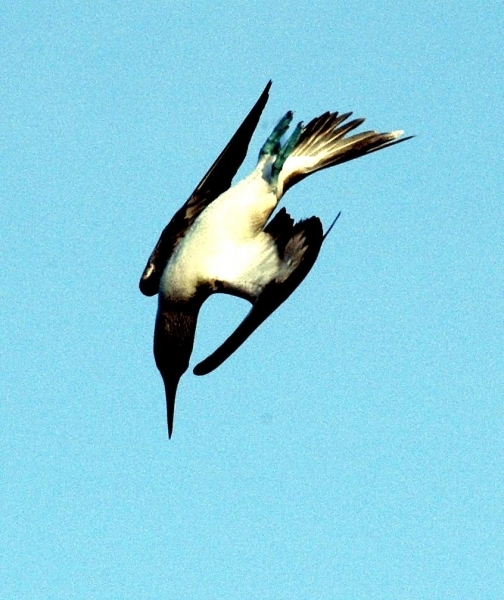 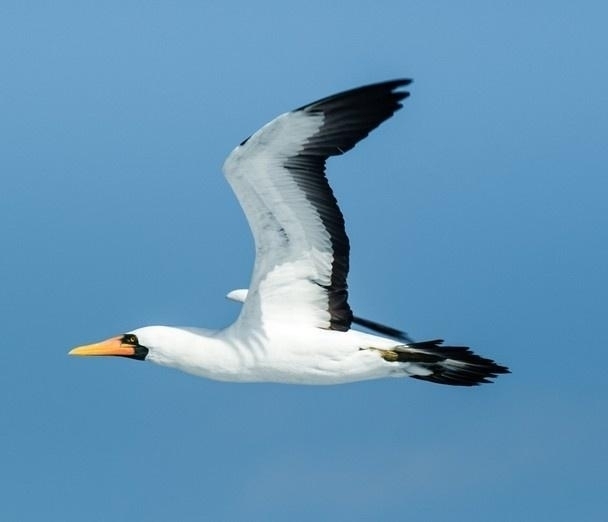 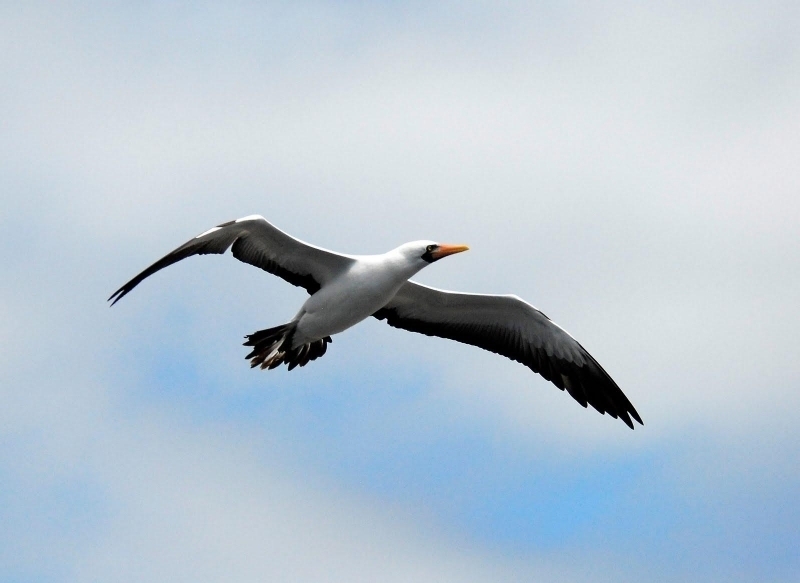 They often nest on the edges of cliffs or in flat areas that allow for easy take-off. 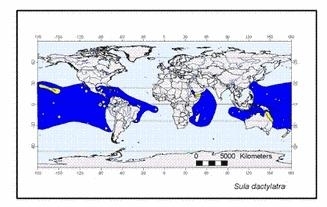 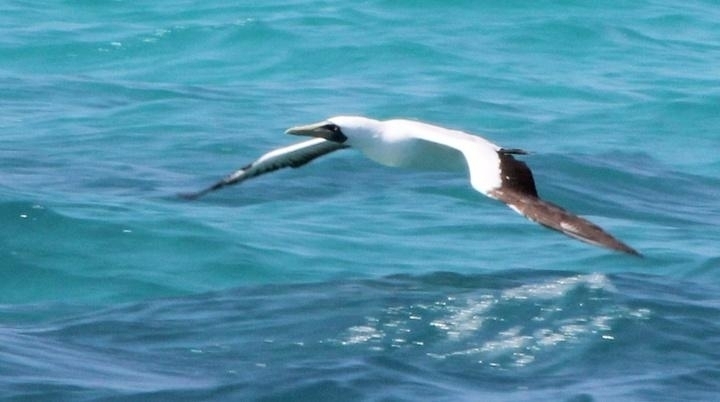 They spend much of their time foraging over the ocean far from land. 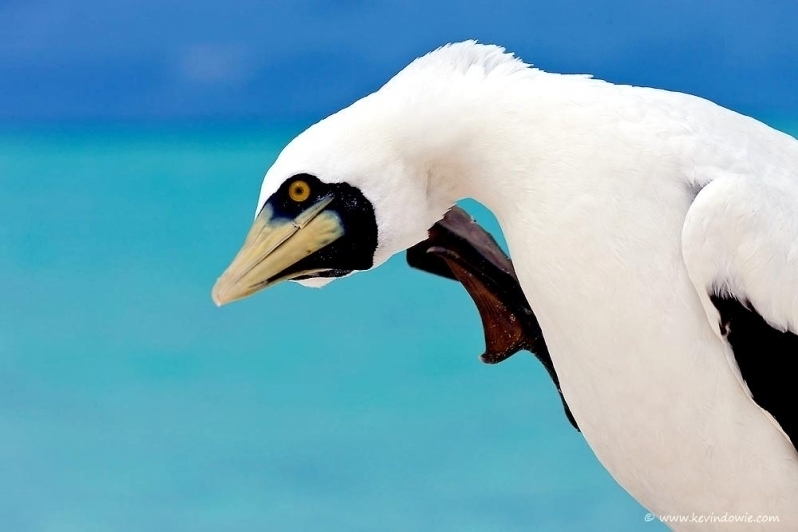 Masked Boobies are graceful birds, their body is white, they have black on their wings & tails and a black mask around their beak & eyes. 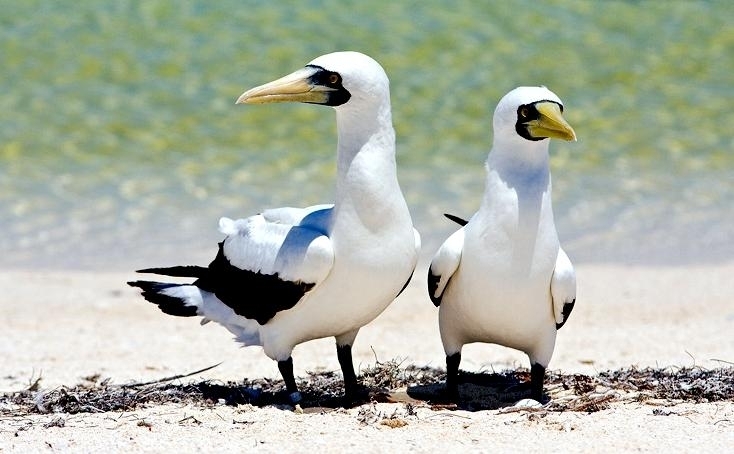 They are the biggest species of Boobies. 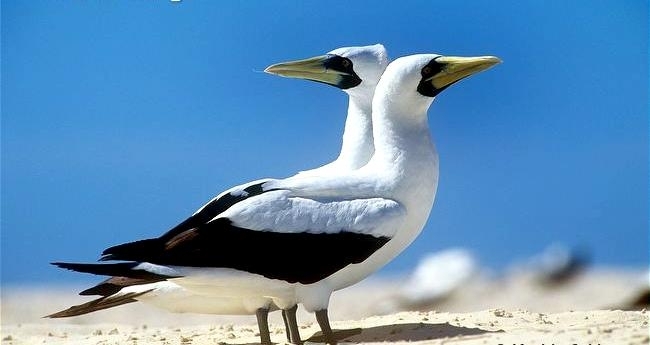 Females are larger than males, ranging from 75 to 86 centimeters long, males are from 74 to 82 centimeters long. 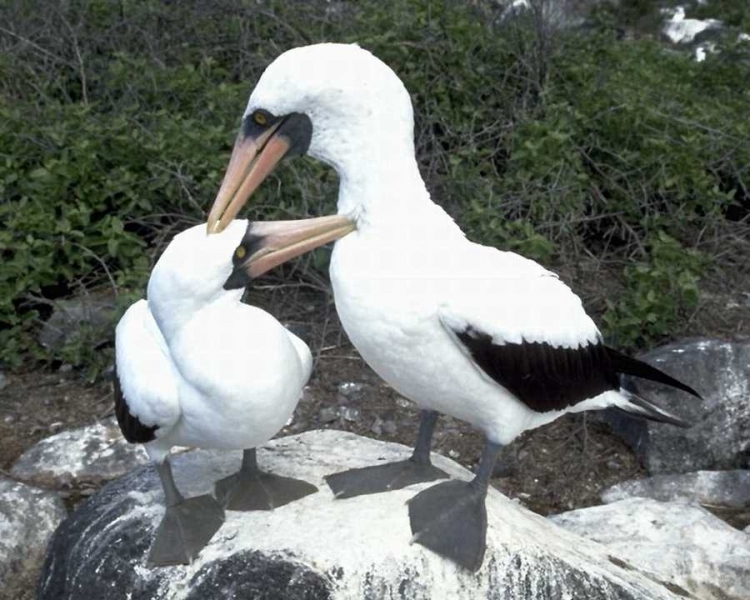 They weigh from 1,220 to 2,353 grams and have wingspans of 152 centimeters on average. 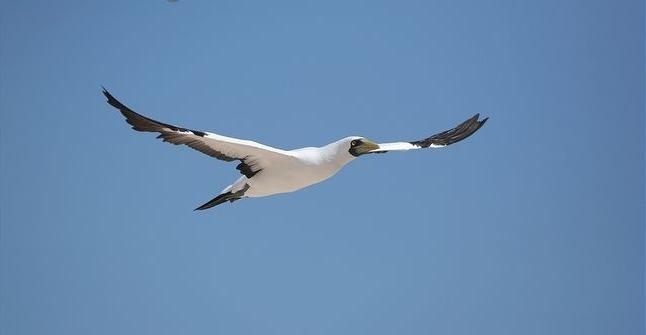 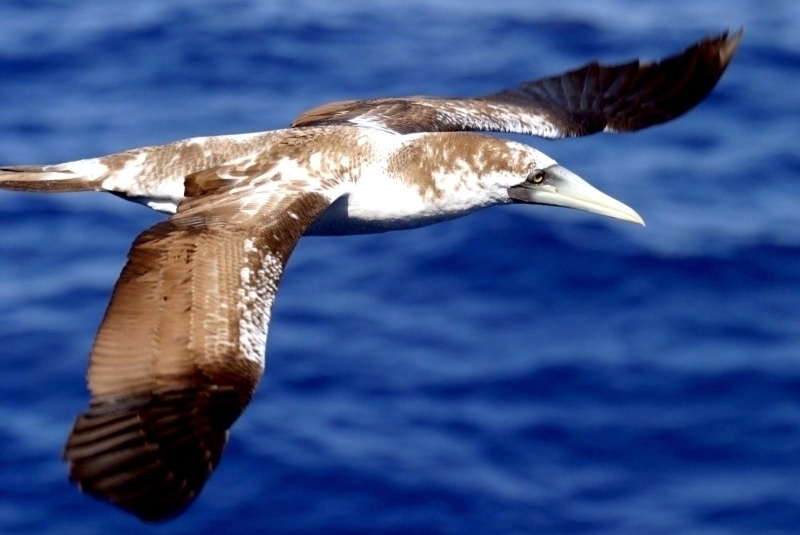 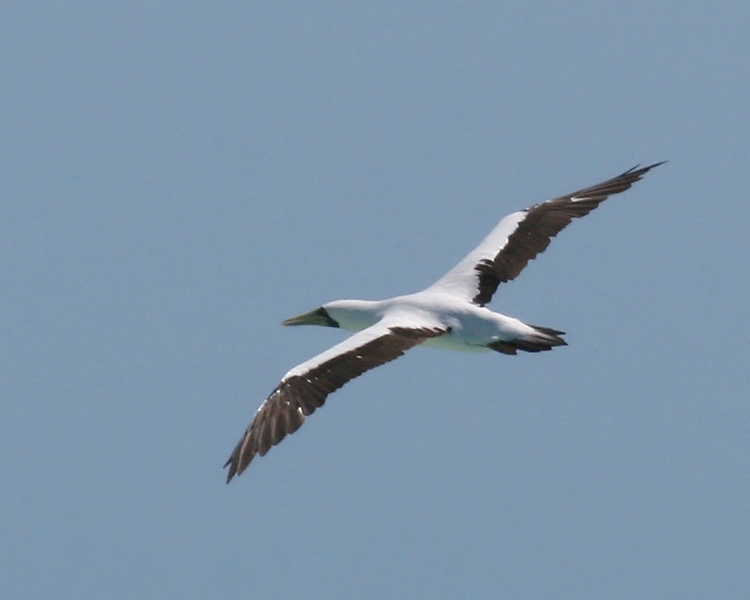 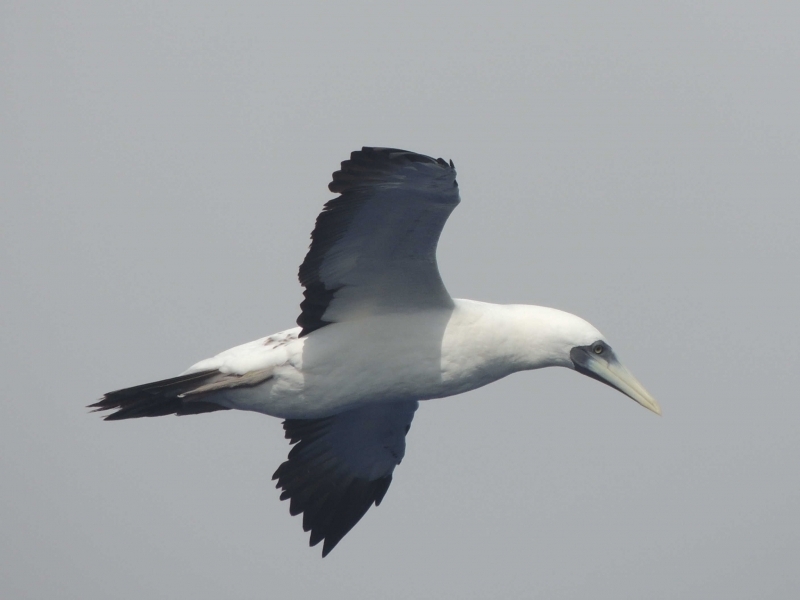 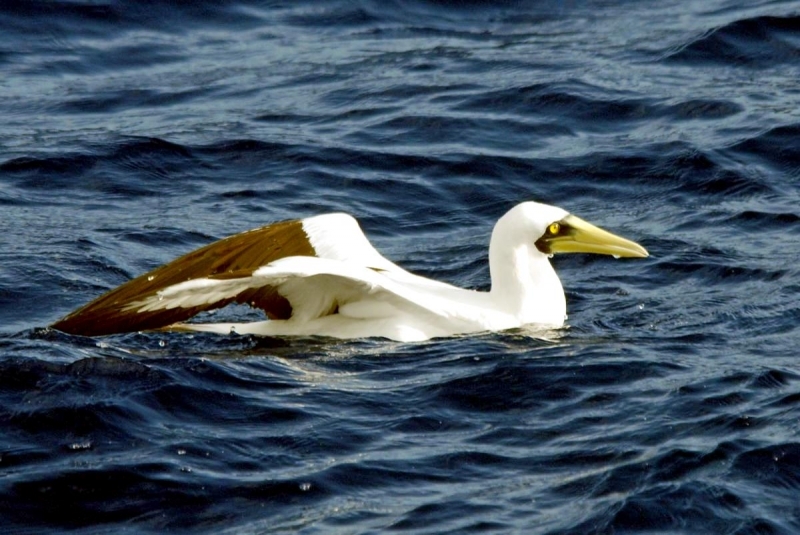 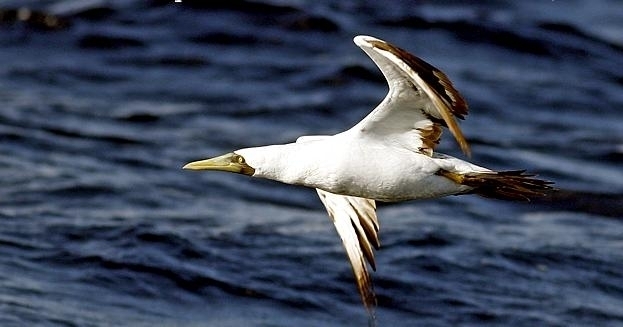 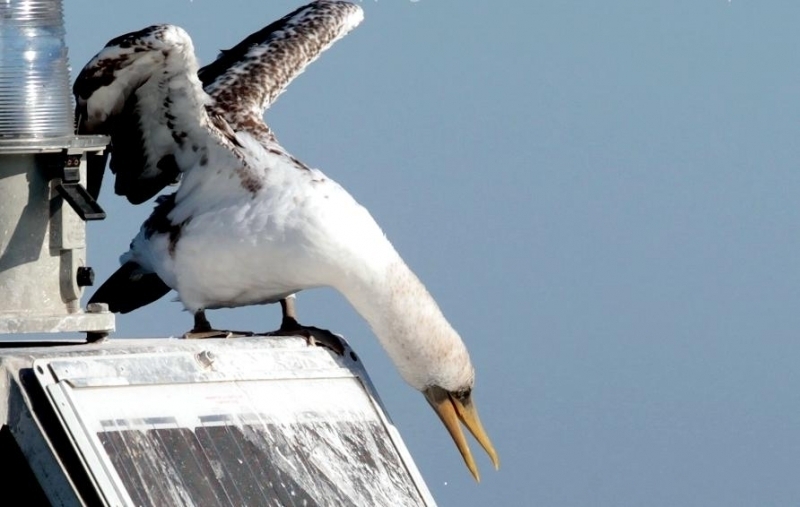 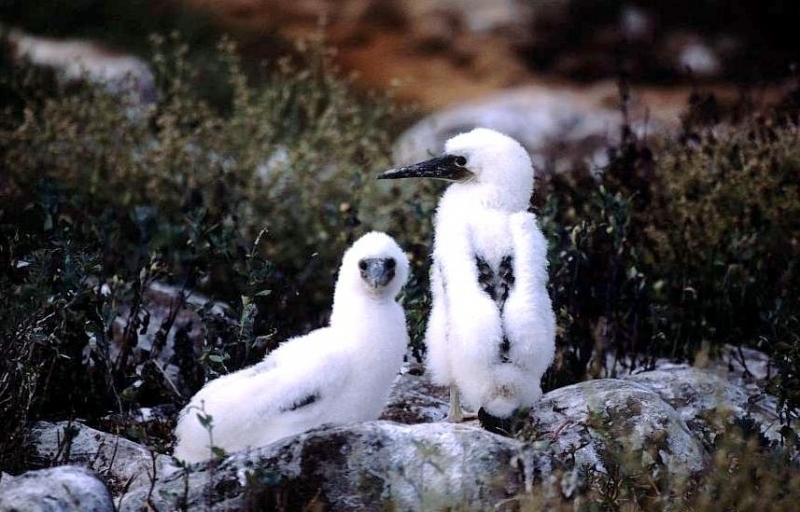 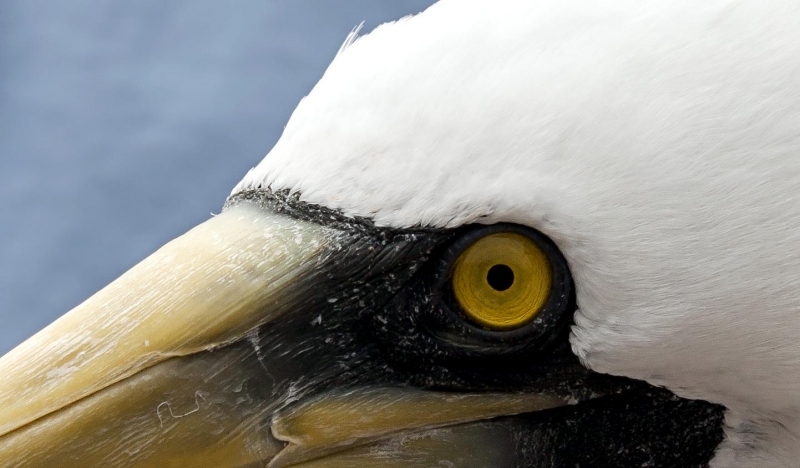 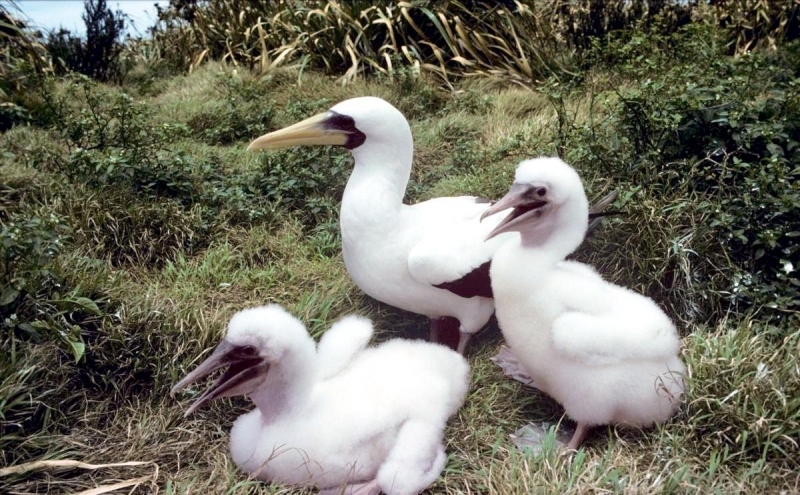 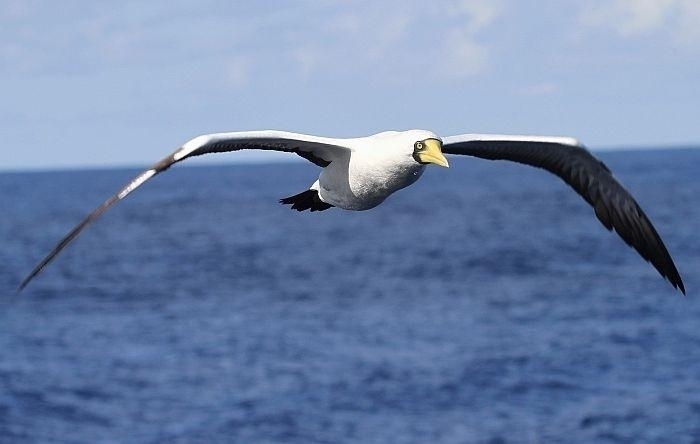 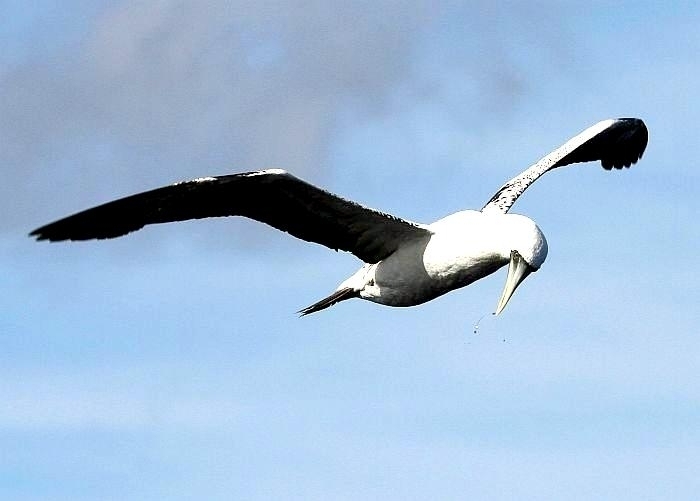 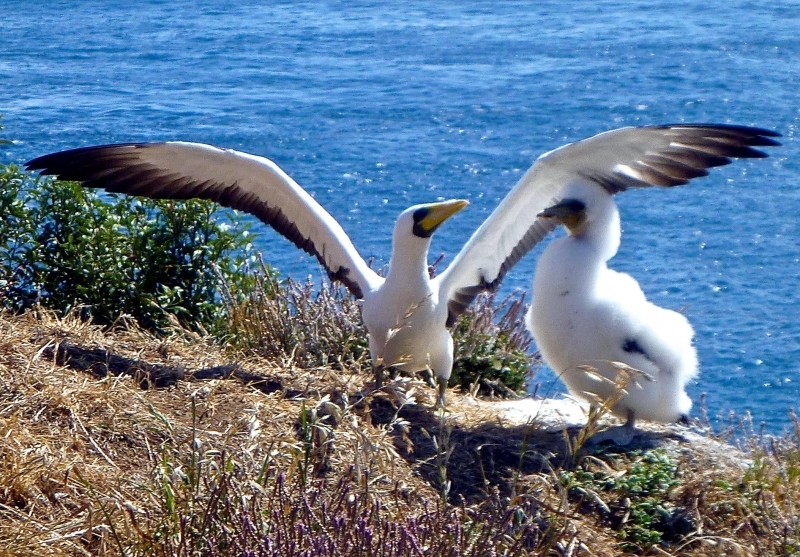 It is difficult to tell males & females apart because they both have bright white plumage as adults; young Masked Boobies are often mistaken for Gannets. 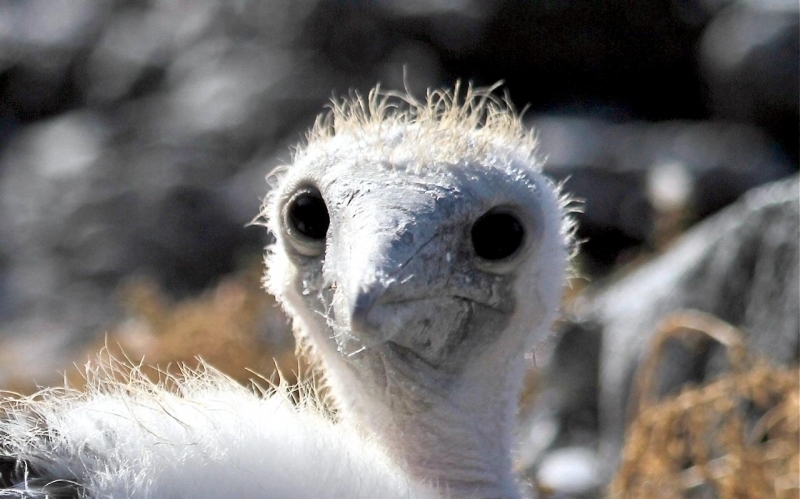 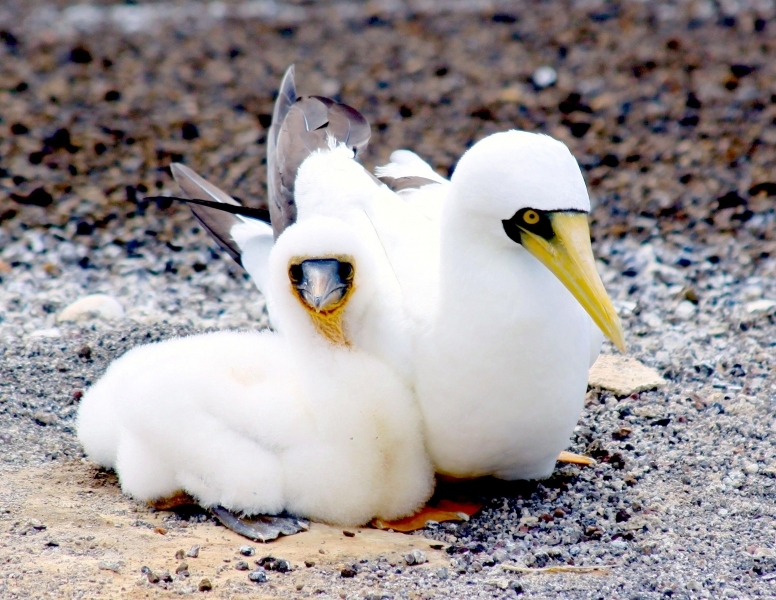 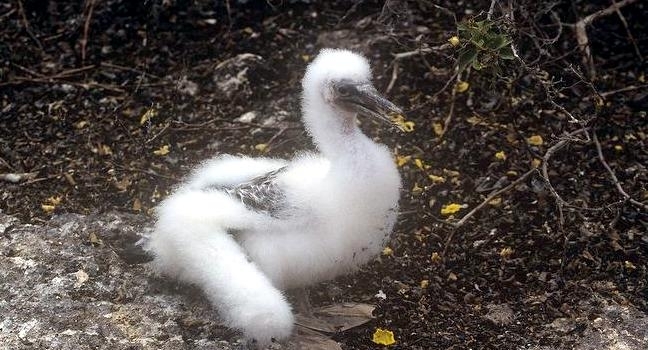 Masked Boobies are born naked but are completely covered with feathers after 35 to 40 days. 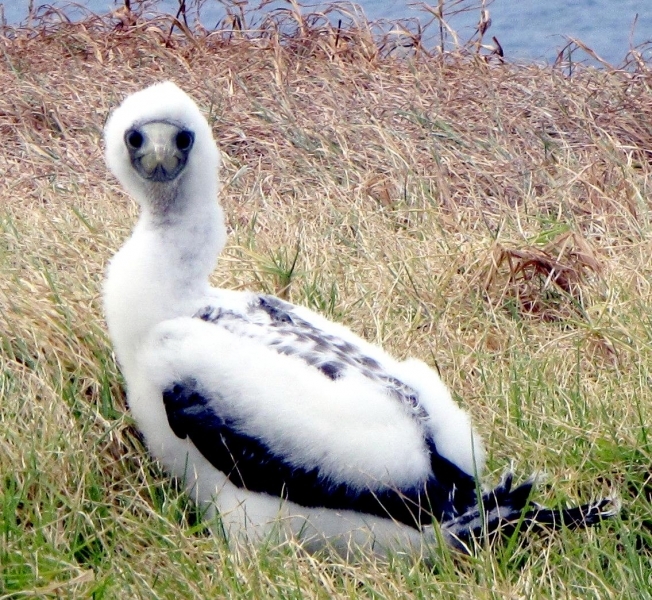 Juveniles are grey with white underparts and do not look like adults until their fourth year. 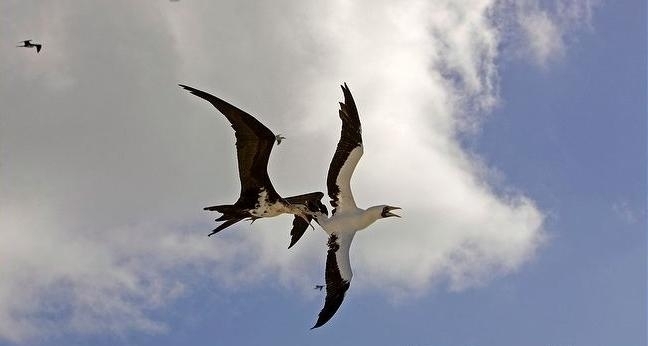 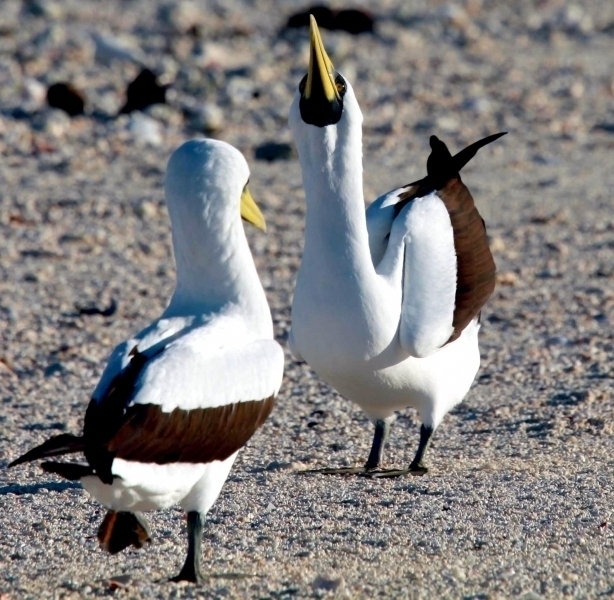 Masked Boobies have intricate mating rituals; males attract females by stretching out their necks and presenting gifts such as small stones and feathers to their perspective mates. 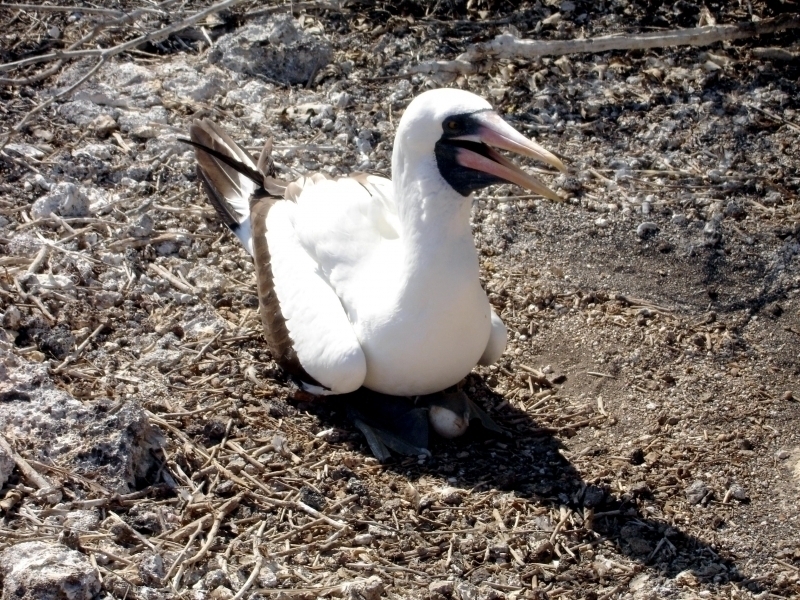 After a slow walk they copulate; copulation takes 10 to 20 seconds and the female begins incubating immediately after laying the first egg. 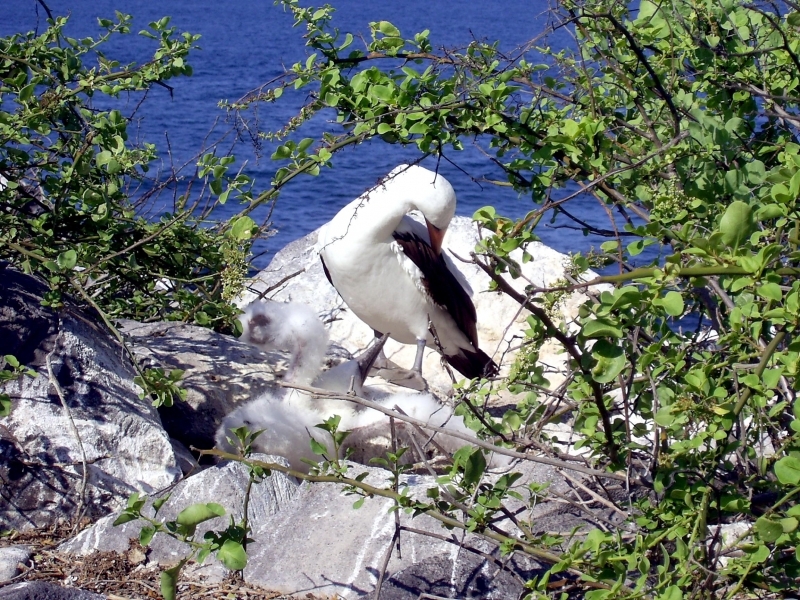 Masked Boobies usually nest colonially. 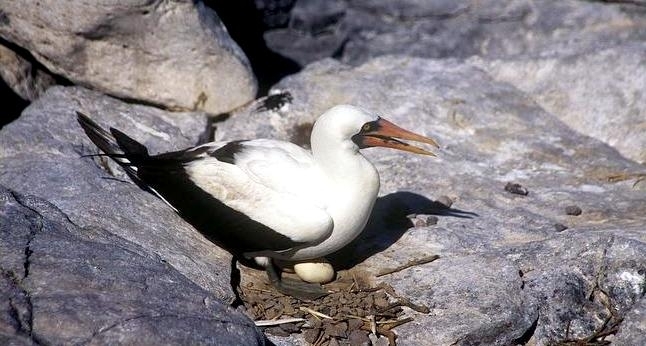 Nesting occurs from February to August, January to July and August to March and their nests are small hollows in the ground. 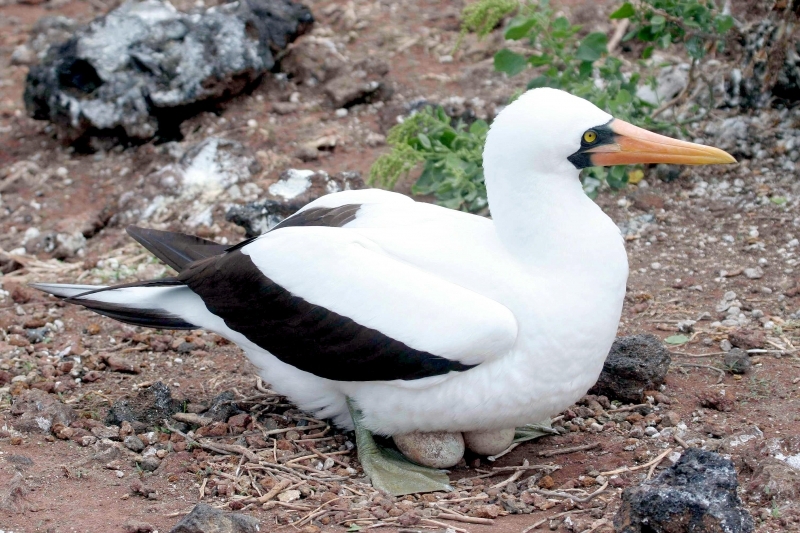 The female usually lays two eggs. 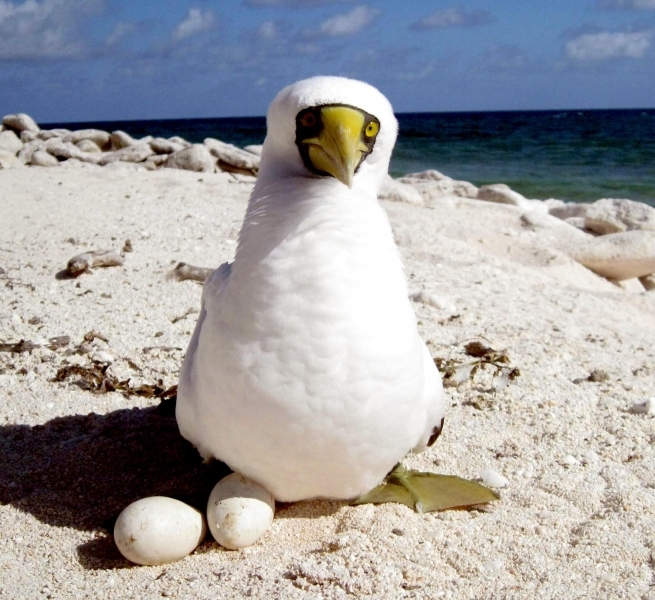 Incubation lasts 43 days on average. 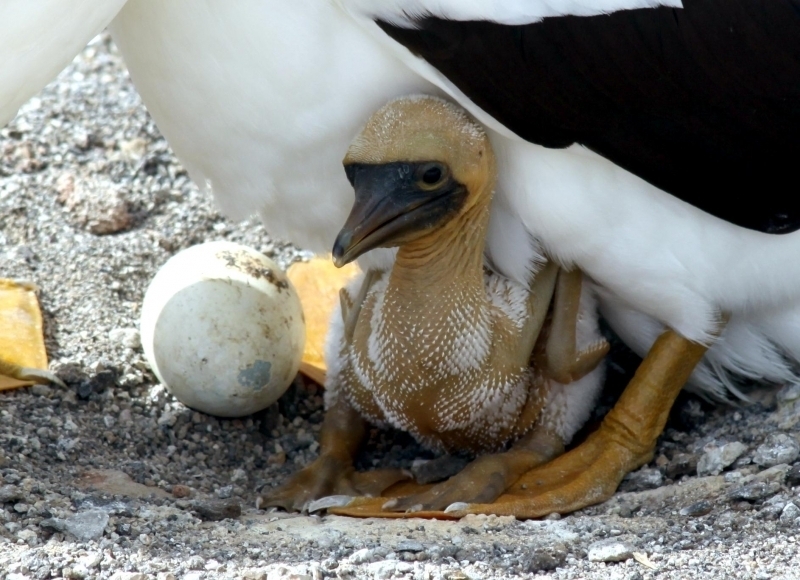 Masked Boobies do not have brood patches, so they incubate the eggs with their feet. 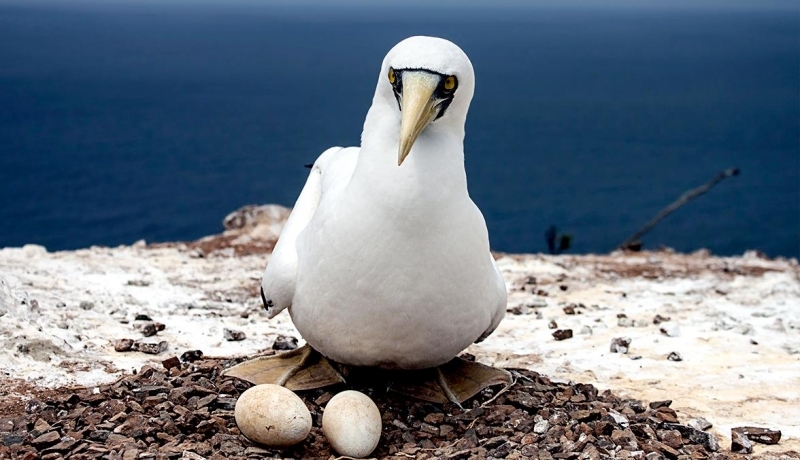 The first chick to hatch kicks the second chick out of the nest, so parents raise only 1 offspring. 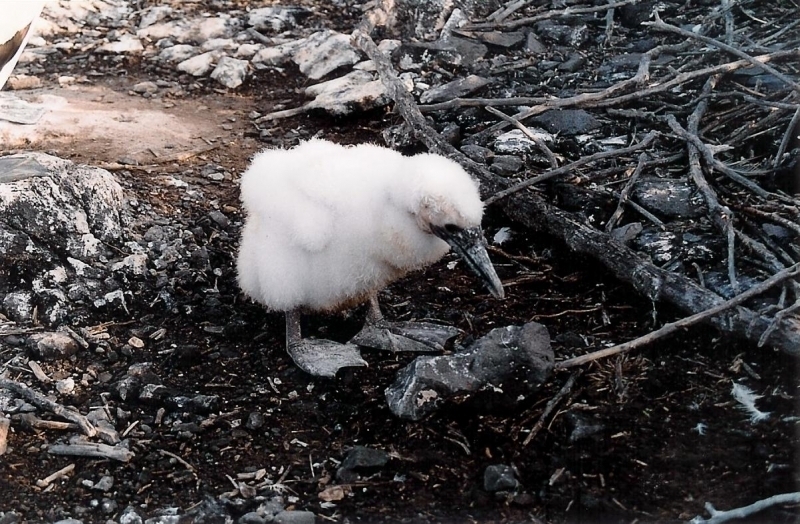 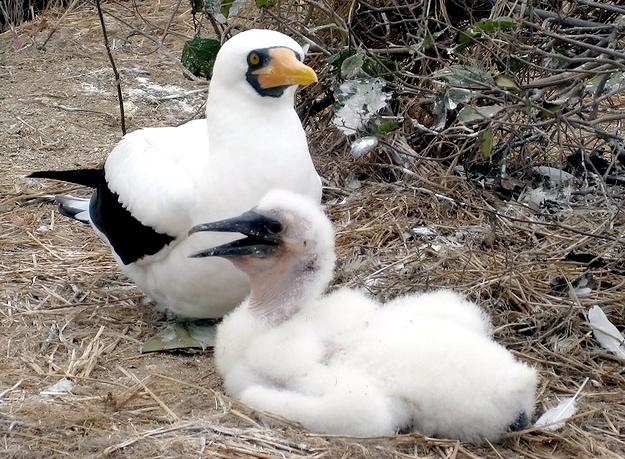 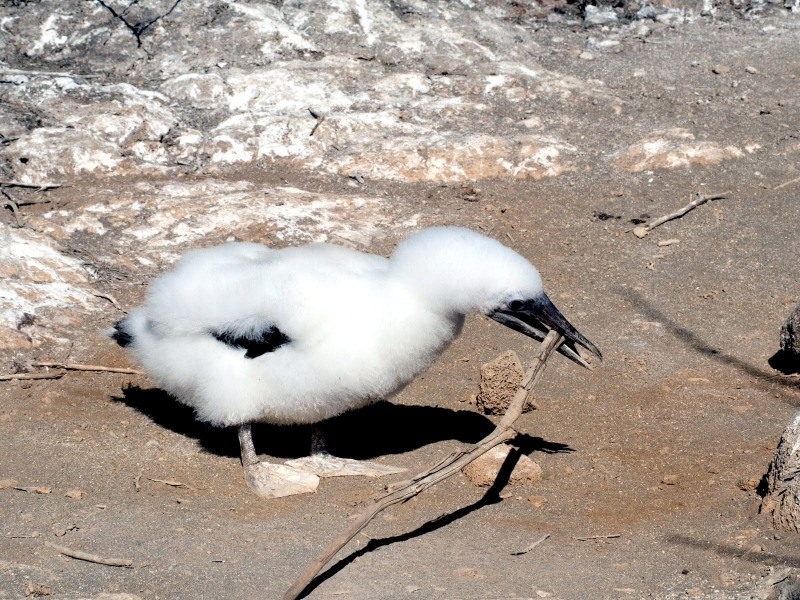 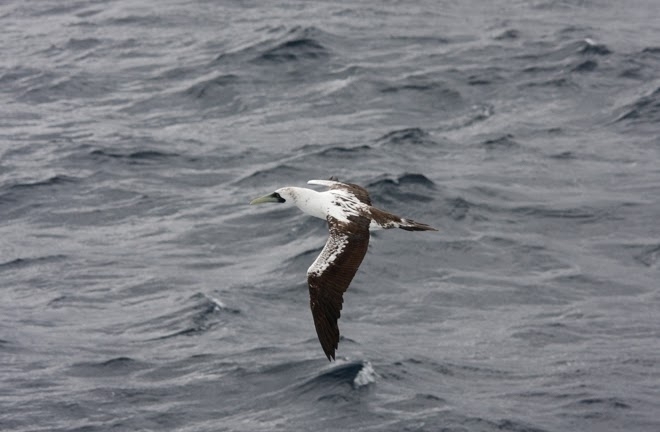 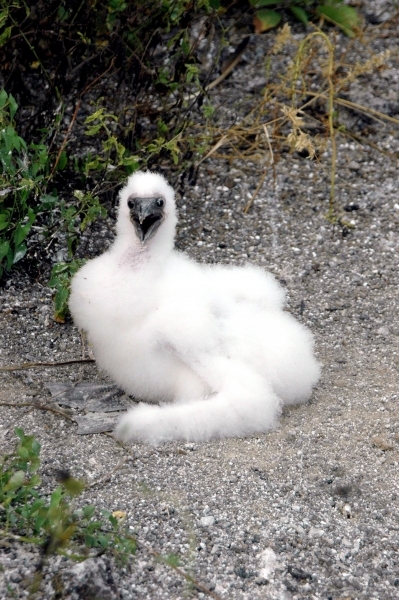 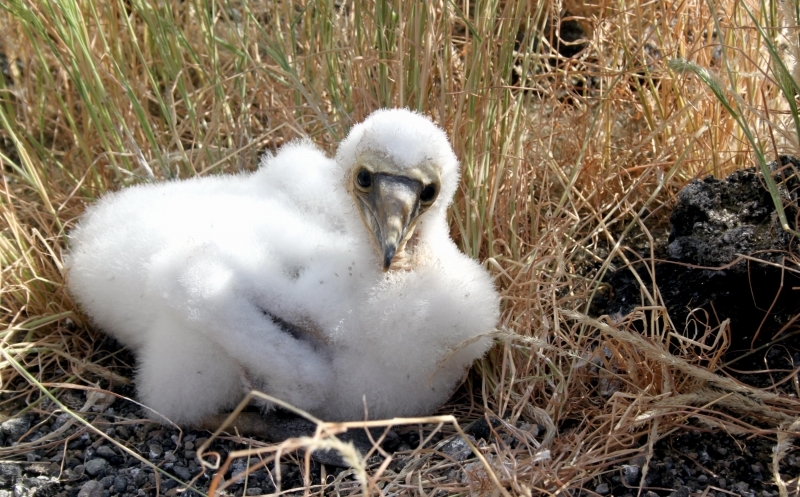 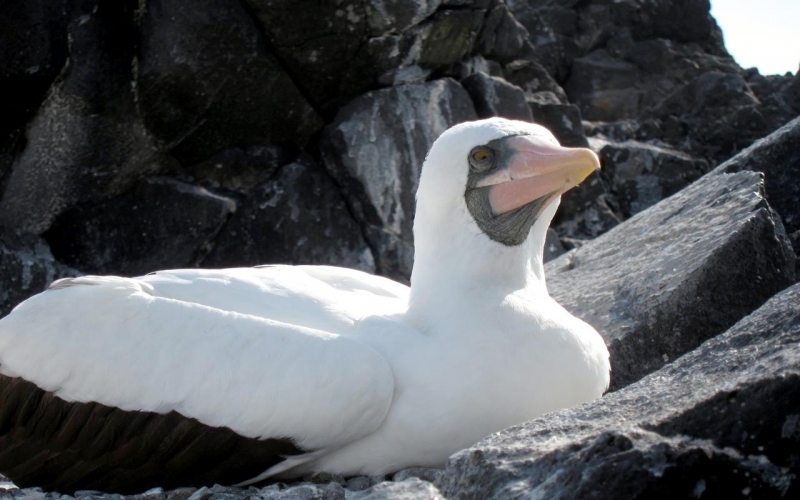 The chick fledges in 109 to 151 days and is independent in 1 to 2 months. 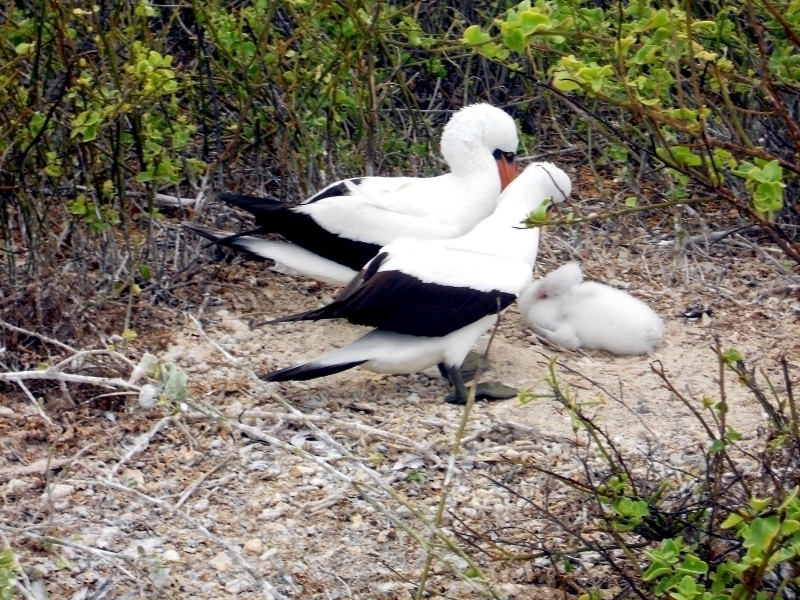 Juveniles reach sexual maturity in 3 to 5 years. 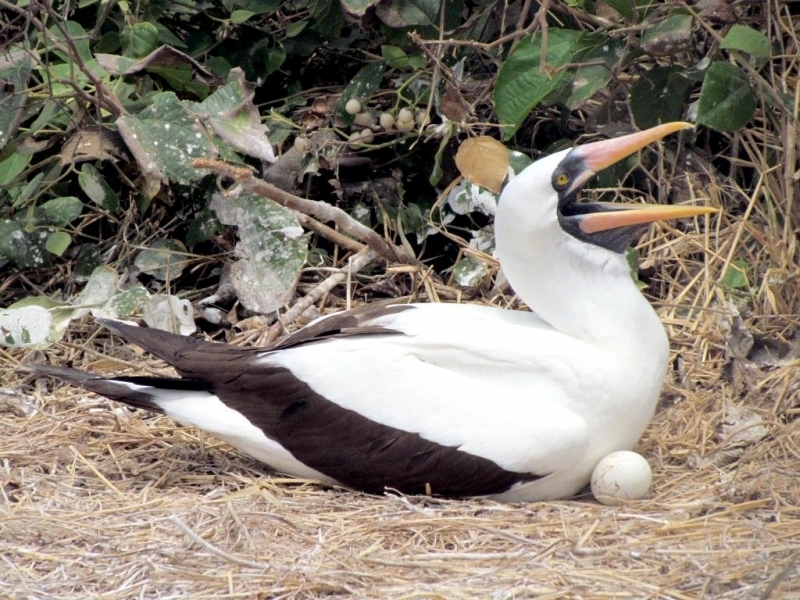 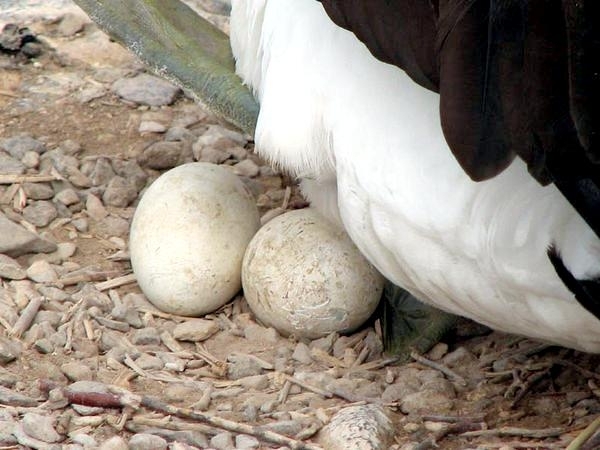 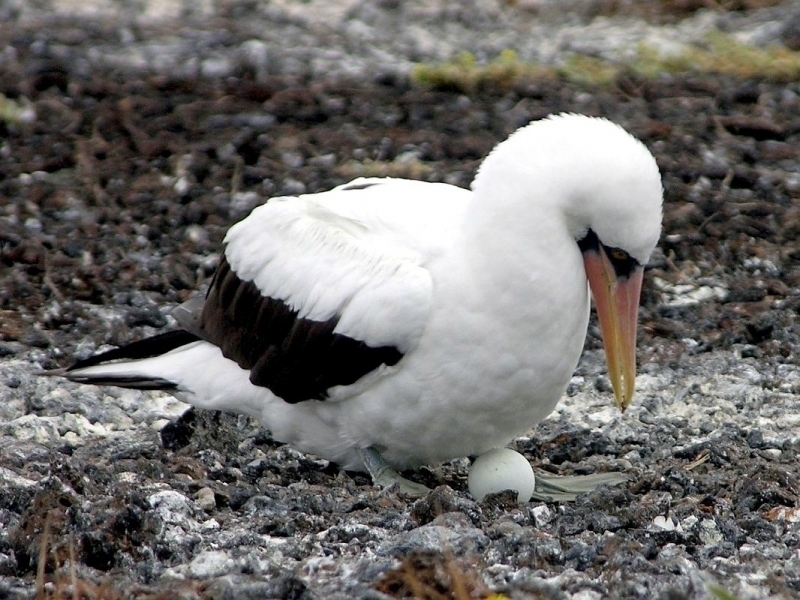 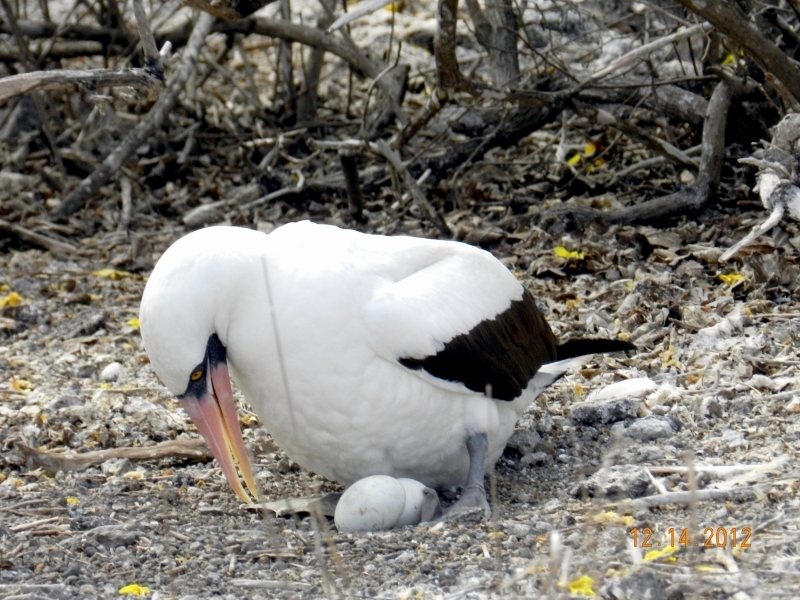 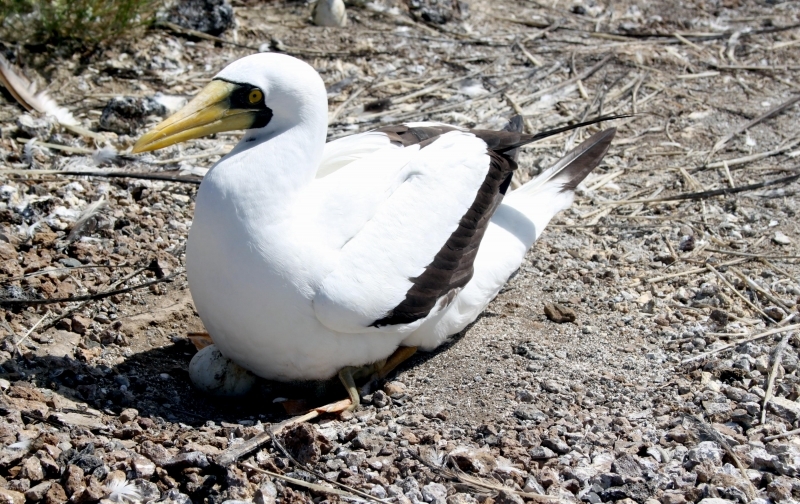 Both males & females incubate the eggs. 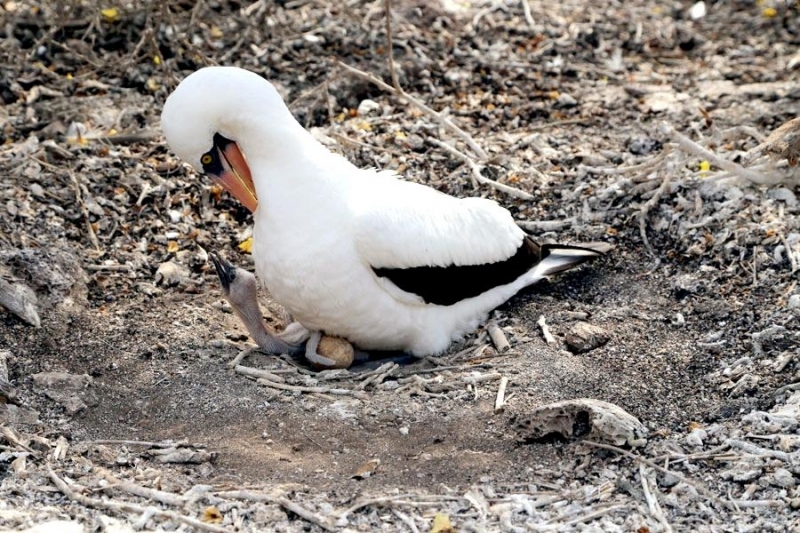 The first chick to hatch kicks the second chick out of the nest, so the parents only raise 1 offspring. 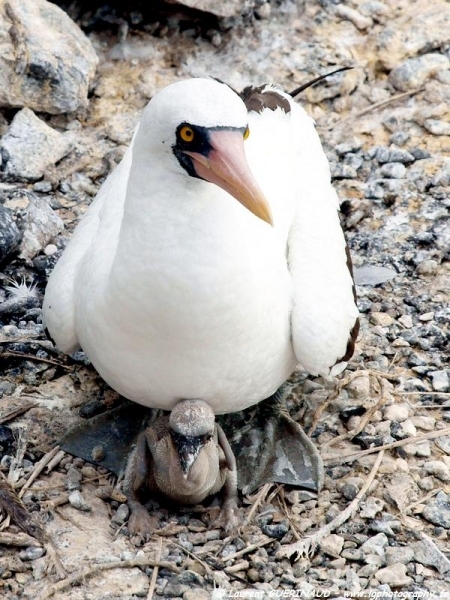 Masked Boobies chicks are usually fed only once or twice a day. 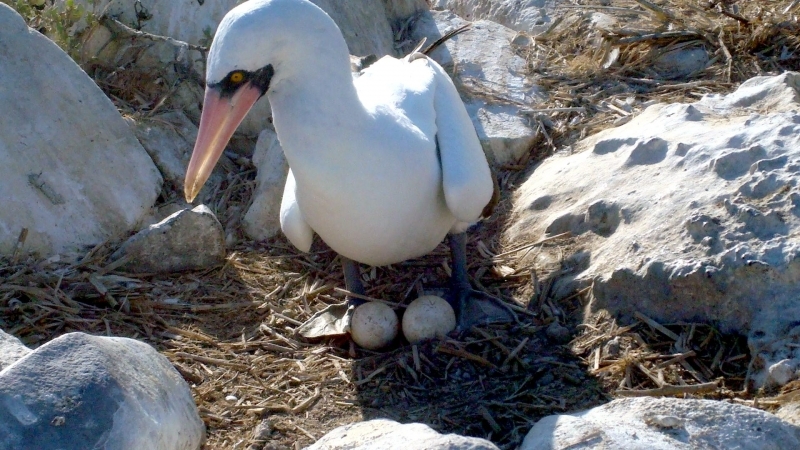 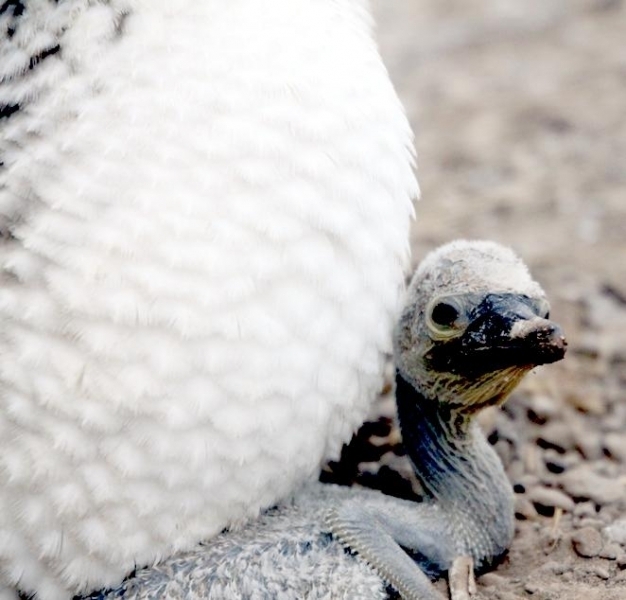 Both parents feed their young, but females may bring more food to the nest than males. 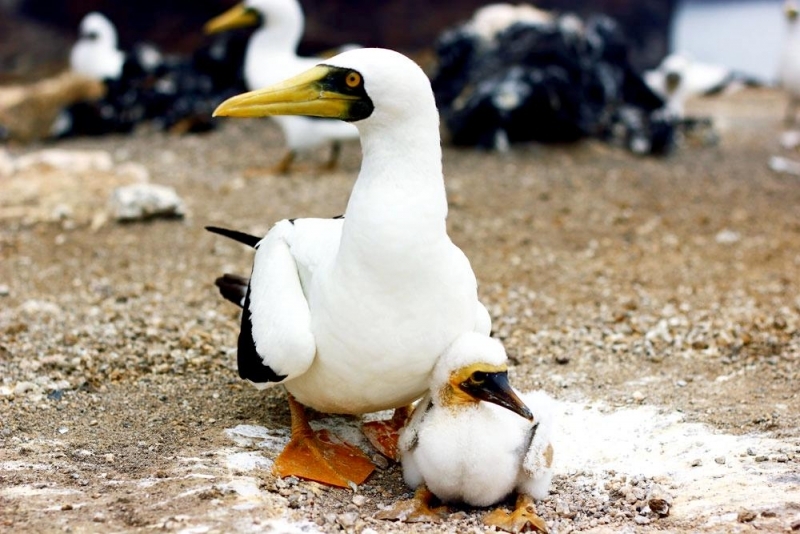 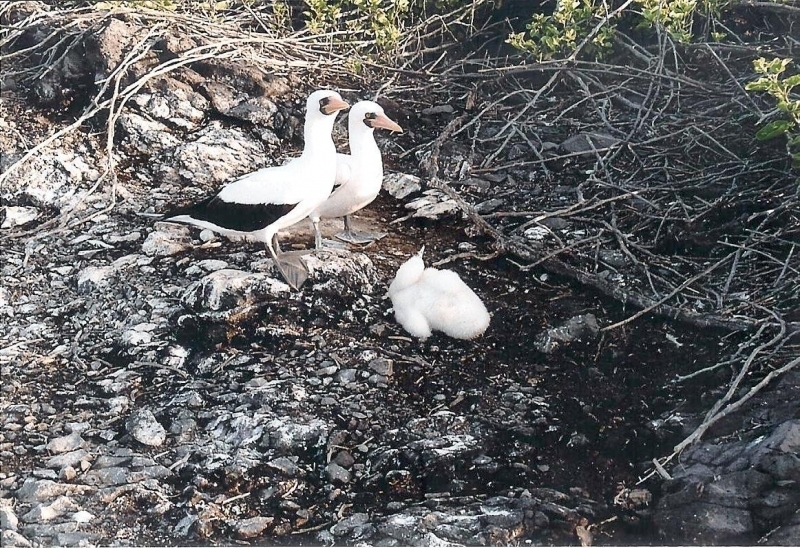 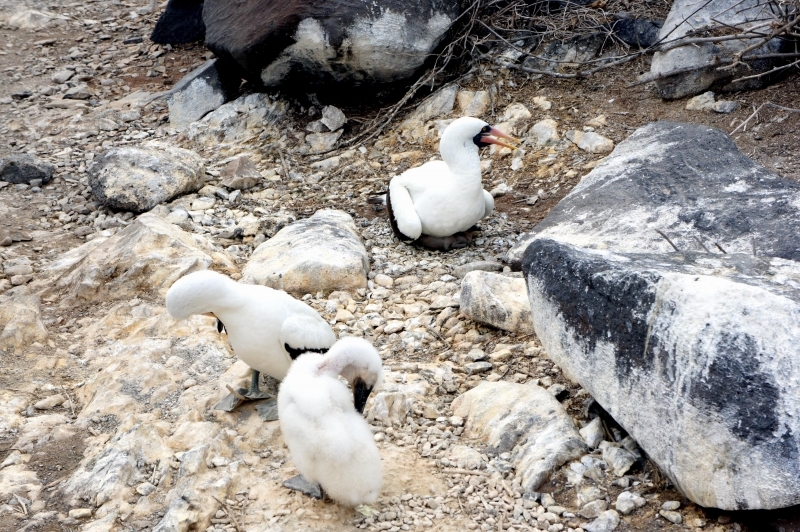 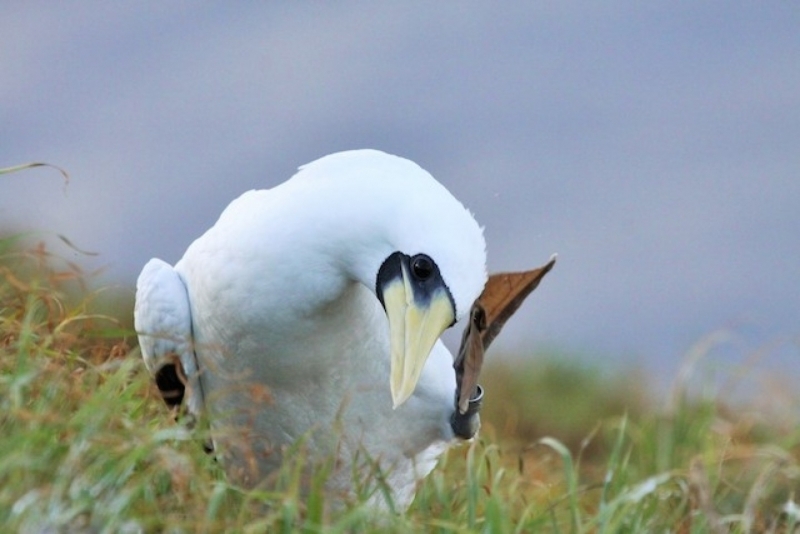 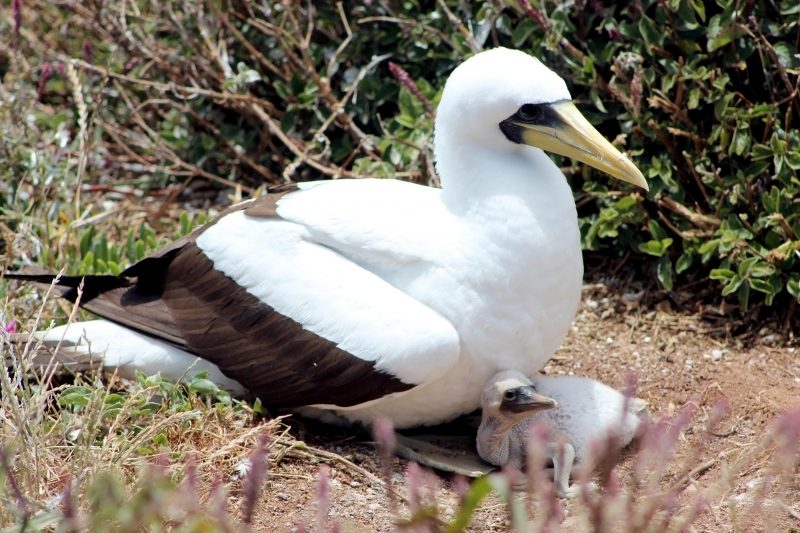 Both parents continue to protect & feed their chick for 1 to 2 months after it fledges. 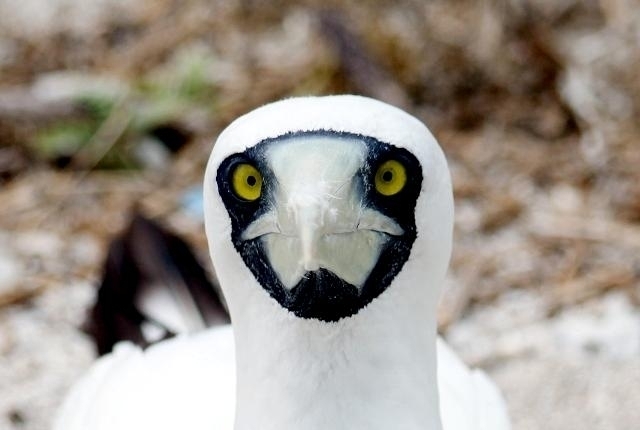 Masked Boobies have a lifespan of 15 to 20 years; the longest known lifespan is 20 years. 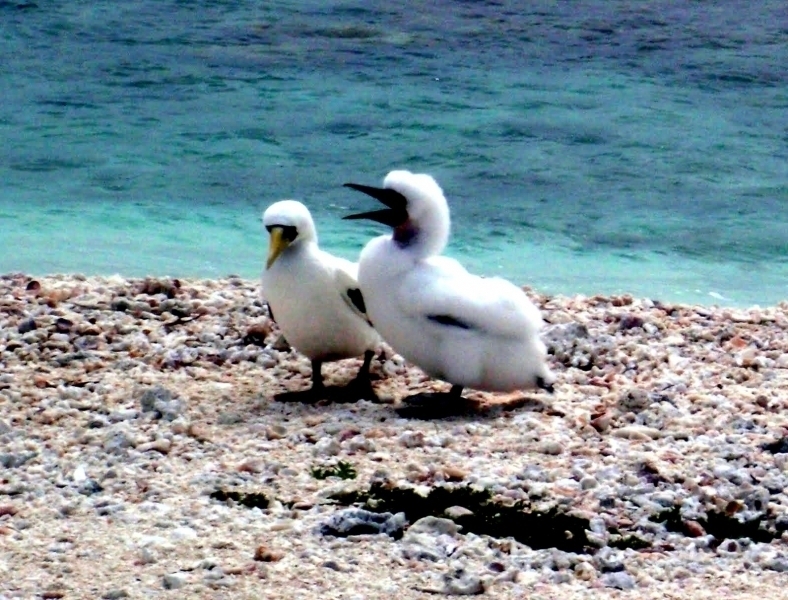 They are quick to sound an alarm if surprised or threatened but are not aggressive and are sometimes friendly to humans. 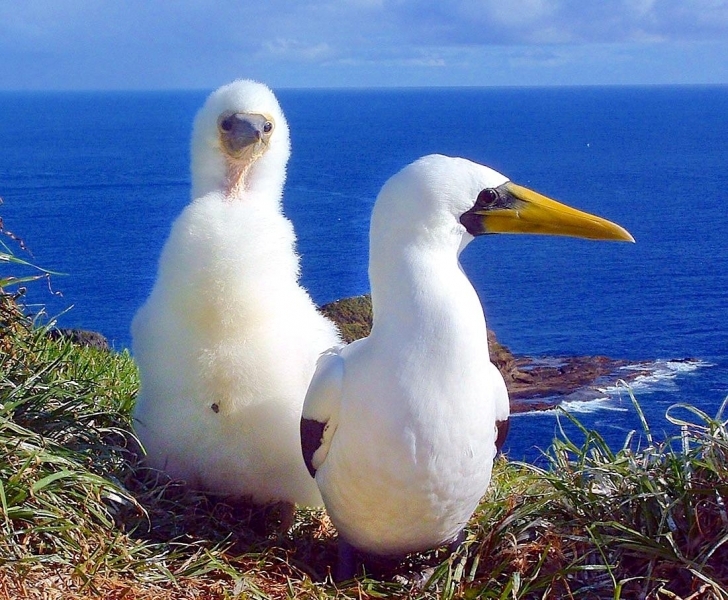 Masked Boobies spend most of their time out at sea in search of food. 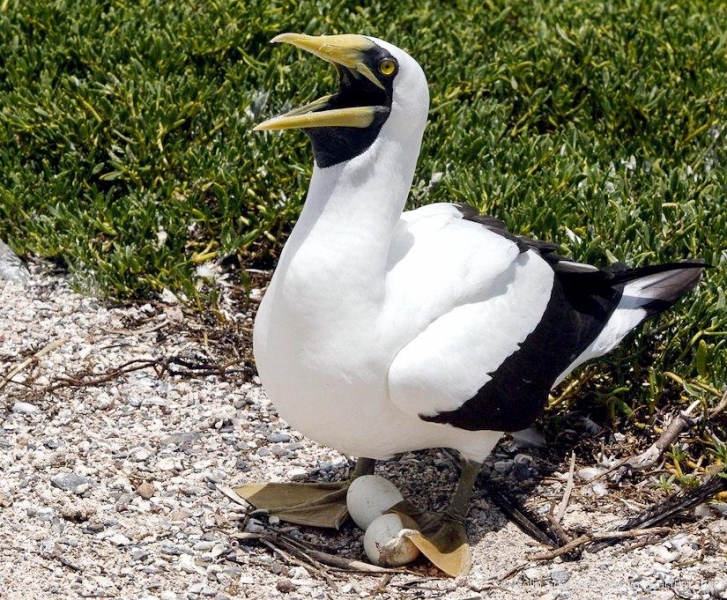 They usually feed diurnally. 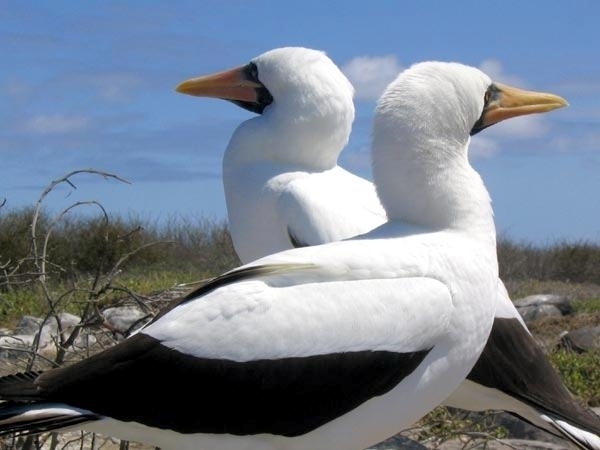 Males have a high-pitched whistle while females have a more “honky” sounding call. 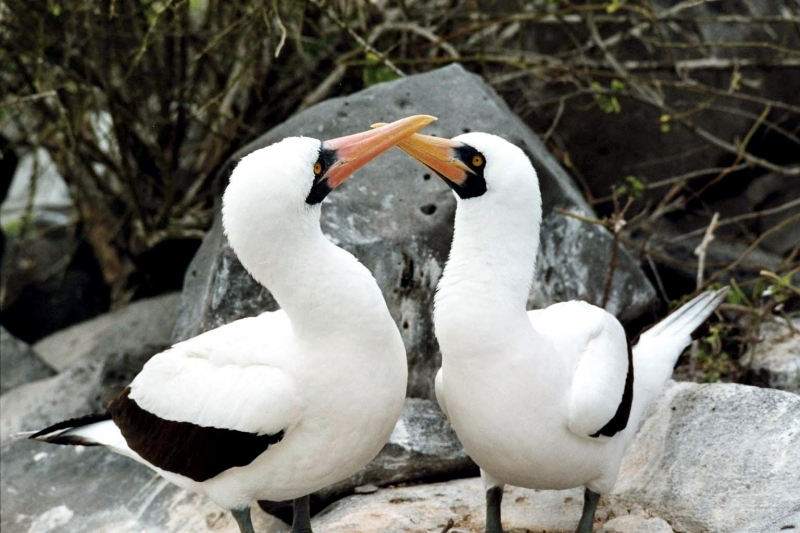 Males will communicate by calling during their courtship displays or when they are frightened or alarmed. 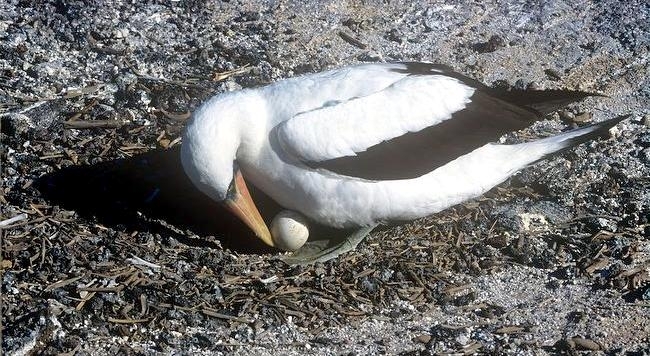 Females only call for help and as a warning. 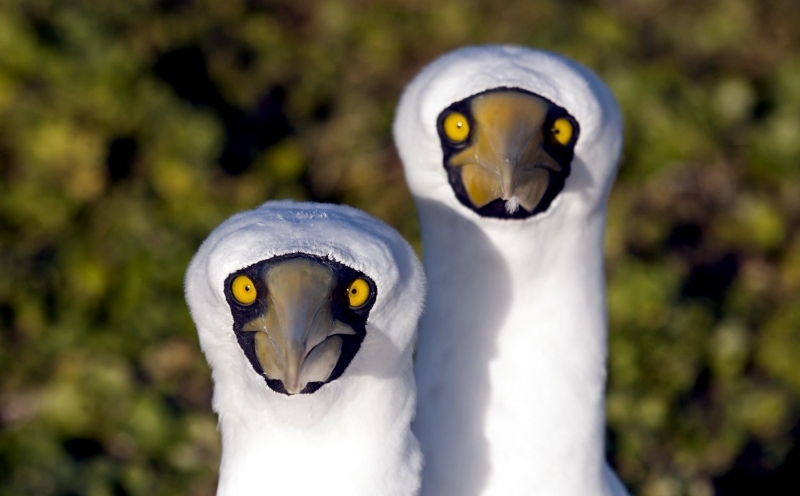 Both sexes are usually silent at night. 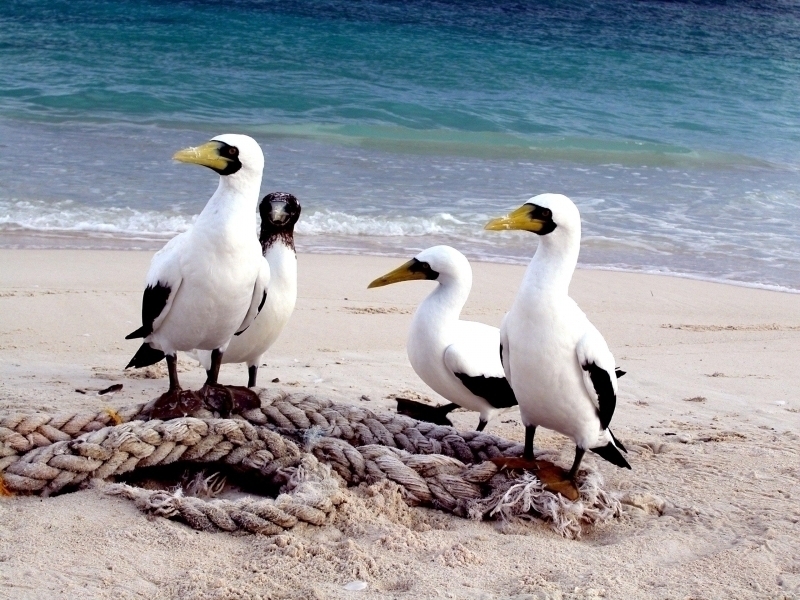 Masked Boobies have a diet consisting mostly of fish & squid. 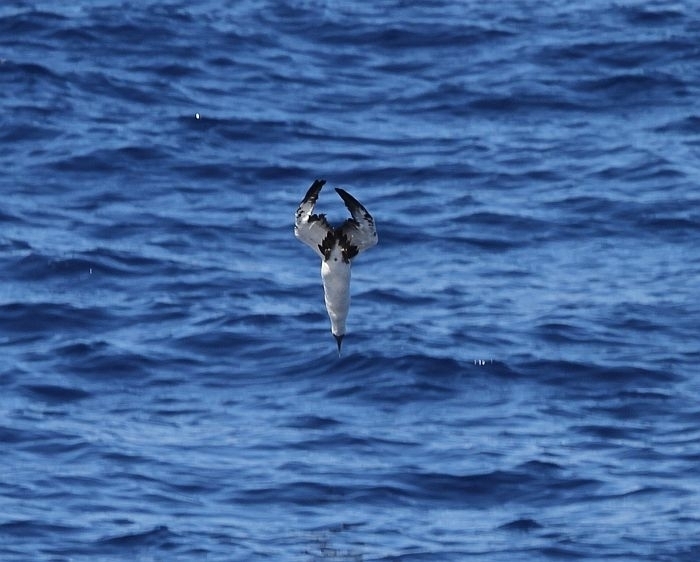 They catch their prey by diving from heights of up to 30 meters. 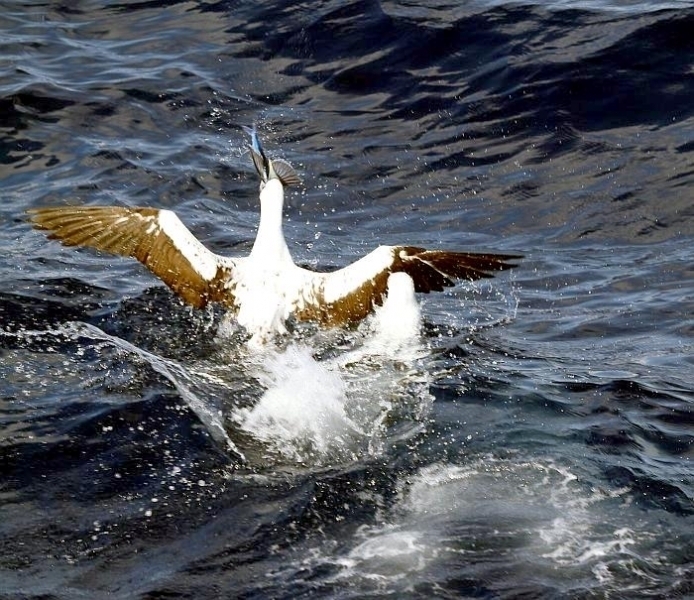 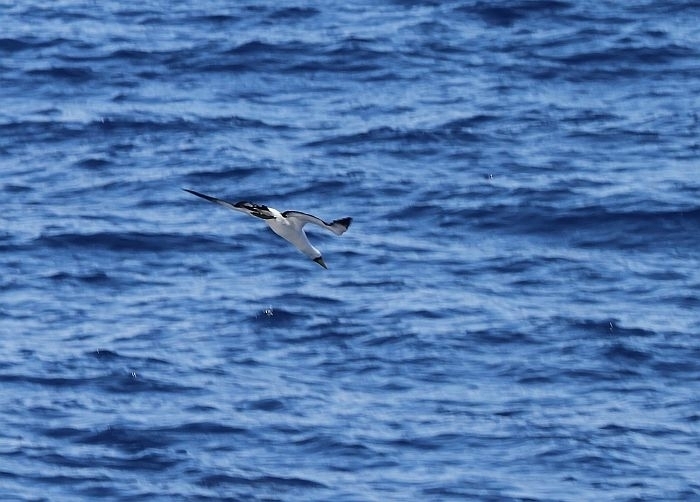 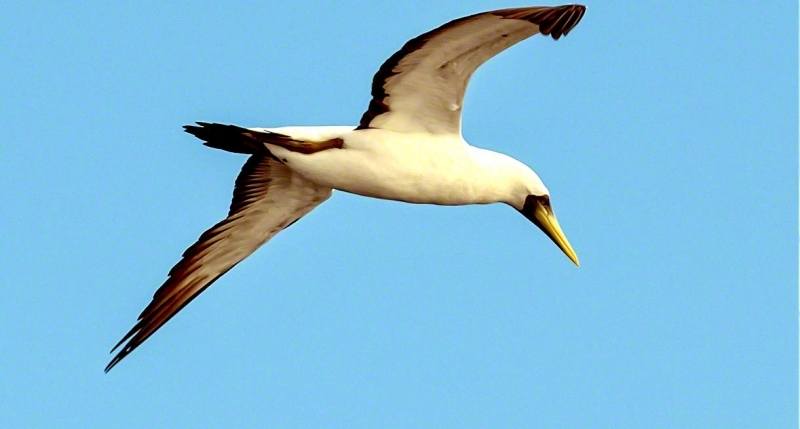 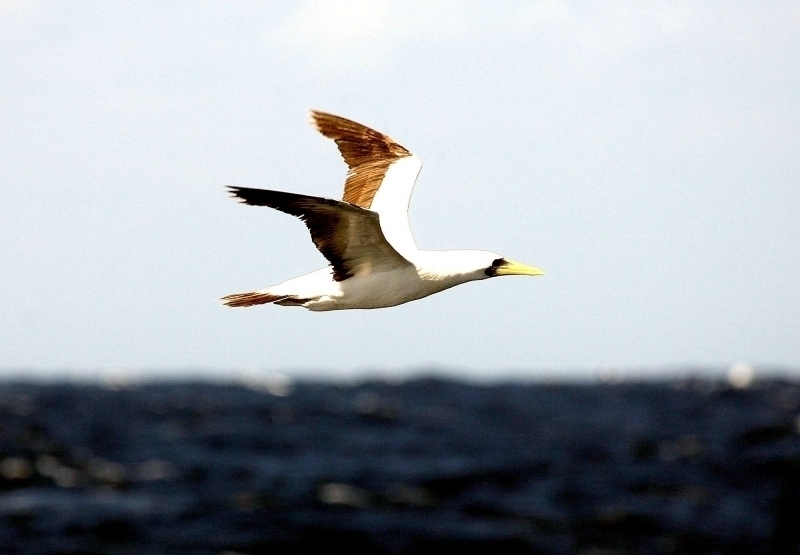 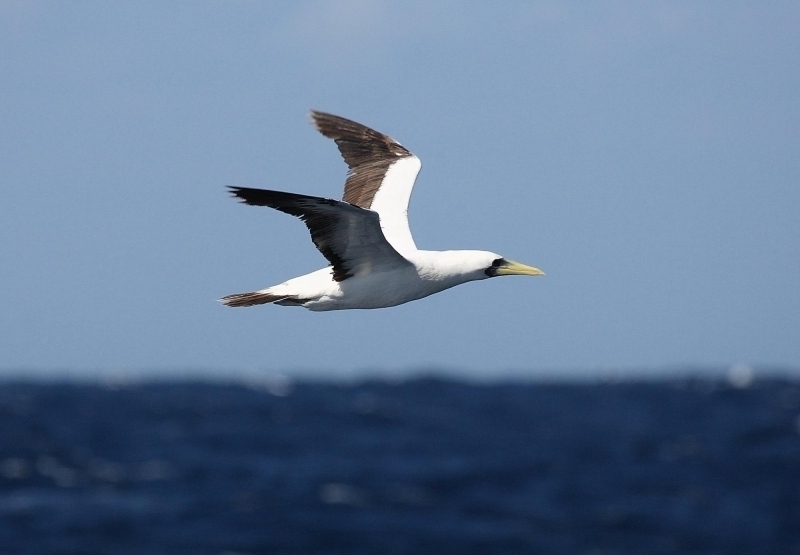 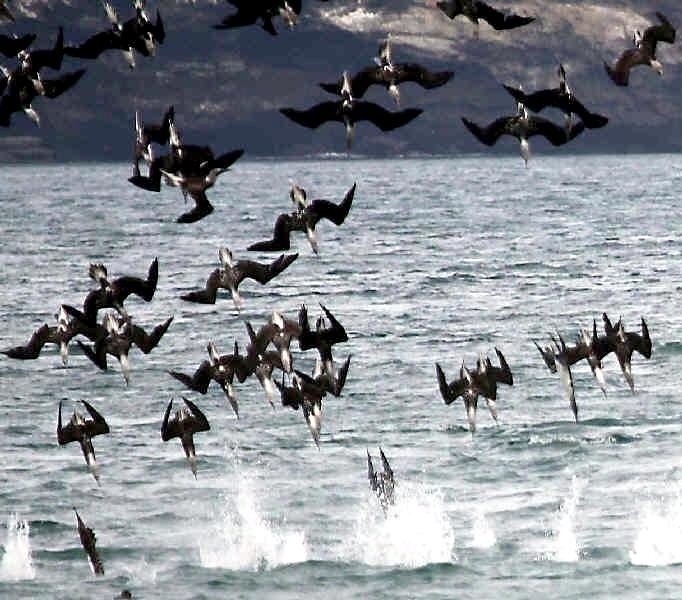 When collecting food for offspring, Masked Boobies usually tend to stay closer to land, otherwise they hunt around 65 kilometers from shore.